The nation’s response to the horrific attacks of September 11, 2001 has taken many forms, from military action to expanded security measures at airports. As important as these measures are, there is probably no more important tool for preventing future attacks on U.S. soil than the nation’s immigration system because the current terrorist threat comes almost exclusively from individuals who arrive from abroad. The purpose of this study is to examine how foreign terrorists have entered and remained in the country in an effort to identify weaknesses in the system that can then lead to meaningful reforms. Rather than just focus on 9/11, we examine terrorism on U.S. soil over the last decade to provide a more complete picture of the threat. While no immigration system can be completely foolproof, if only some of those involved in a terrorist plot can be stopped by our immigration system, it is possible that whatever conspiracy they are part of could be uncovered. Including the 9/11 hijackers, 48 foreign-born militant Islamic terrorists have been charged, been convicted, pled guilty, or admitted to involvement in terrorism within the United States since 1993. Almost all of these individuals are now thought to be linked to Osama bin Laden’s al Qaeda organization. This study focuses on militant Islamic terrorists because the threat they pose dwarfs that from any other terrorists, foreign or domestic. In addition to 9/11, some of the plots examined in the study include the murder of employees outside of CIA headquarters, the first attack on the World Trade Center, a plot to bomb the subway in Brooklyn, plots to bomb New York City landmarks, and the Millennium plot to bomb Los Angeles International Airport. Foreign-born militant Islamic terrorists have used almost every conceivable means of entering the country. They have come as students, tourists, and business visitors. They have also been Lawful Permanent Residents (LPRs) and naturalized U.S. citizens. They have snuck across the border illegally, arrived as stowaways on ships, used false passports, and have been granted amnesty. Terrorists have even used America’s humanitarian tradition of welcoming those seeking asylum. Although the 9/11 hijackers entered on temporary visas, LPRs as well as naturalized U.S. citizens have played key roles in terrorism on U.S. soil. For example, Siddig Ibrahim Siddig Ali, ringleader of the plot to bomb New York City landmarks in 1993, is an LPR, and Ali Mohammed, who wrote al Qaeda’s terrorist handbook on how to operate in the West, is a naturalized U.S. citizen. The nation’s humanitarian tradition of offering refuge to those fleeing persecution has also been exploited by a number of terrorists. In addition to the three terrorists who had asylum claims pending when they committed their crimes, three other terrorists, such as Gazi Ibrahim Abu Mezer, who tried to bomb the Brooklyn borough subway in 1997, used a false asylum claim to prevent deportation prior to taking part in terrorism. Violations of immigration laws are very common among terrorists. Not only were 12 of the 48 terrorists illegal aliens when they committed their crimes, at least five others had lived in the country illegally at some point prior to taking part in terrorism. At least five others had committed significant violations of immigration laws prior to their taking part. For those that were illegal aliens, most entered legally on temporary visas and then overstayed. However, some snuck across the northern border, such as Abdel Hakim Tizegha, who was involved in the Millennium plot. In addition to overstaying a visa, terrorists have violated immigration laws in a number of different ways. Some terrorists have engaged in fraudulent marriages to American citizens, such as Fadil Abdelgani, who took part in the plot to bomb New York City landmarks, and Khalid Abu al Dahab, who raised money and helped recruit new members for al Qaeda from within the United States. Terrorists also violated immigration laws by providing false information on their applications for permanent residence, such as Sheik Omar Abdel Rahman, who inspired several terrorist plots. Still other terrorists have violated the law by working illegally in the United States. At least eight terrorists held jobs for extended periods while living in the country illegally before taking part in terrorism, including those involved in the 1993 Trade Center attack, the plot to bomb New York landmarks, and the Millennium plot. A lack of detention space has allowed several terrorists who had no legal right to be in the country to be released into the country. For example, Ramzi Yousef, the mastermind of the 1993 World Trade Center Attack, did not have a visa to enter the country, but he applied for asylum when he arrived at JFK airport and because of a lack of detention space he was paroled into the country. Past amnesties for illegal aliens have facilitated terrorism. Mahmud Abouhalima, a leader of the 1993 Trade Center bombing, was legalized as a seasonal agricultural worker as part of the 1986 amnesty. Only after he was legalized was he able to travel outside of the country, including several trips to the Afghanistan/Pakistan border, where he received the terrorist training he used in the bombing. Past amnesties have not hindered terrorism. Mohammed Salameh, another conspirator in the 1993 Trade Center bombing, applied for the same amnesty as Abouhalima and was denied. But, because there is no mechanism in place to force people who are denied permanent residency to leave the country, he continued to live and work in the United States illegally and ultimately took part in the 1993 attack. Several terrorists should probably have been denied temporary visas because they had characteristics that made it likely they would overstay their visa and try to live in the United States illegally. Under Section 214(b) of immigration law, individuals who are young, unmarried, have little income, or otherwise lack strong attachment to a residence overseas are to be denied temporary visas. Several of the 9/11 hijackers, including the plot’s leader Mohammed Atta, fit these criteria. The visa waiver program, which allows individuals from some countries to visit the United States without a visa, has been exploited by terrorists. French-born Zacarias Moussaoui, who may have been the intended 20th hijacker on 9/11, entered the country using the visa waiver program. Other terrorists such as Ahmed Ajaj, Ramzi Yousef, and Ahmed Ressam attempted to use false passports from visa waiver countries to enter the United States. The vast majority of terrorists in the study (41 of 48) were approved for visas by an American consulate overseas prior to entering the country. Of the seven who did not have visas, three snuck into the country and four arrived at a port of entry without a visa. At least two terrorists, Sheik Omar Abdel Rahman and Ali Mohammed, should have been denied visas because they were on the watch list of suspected terrorists. 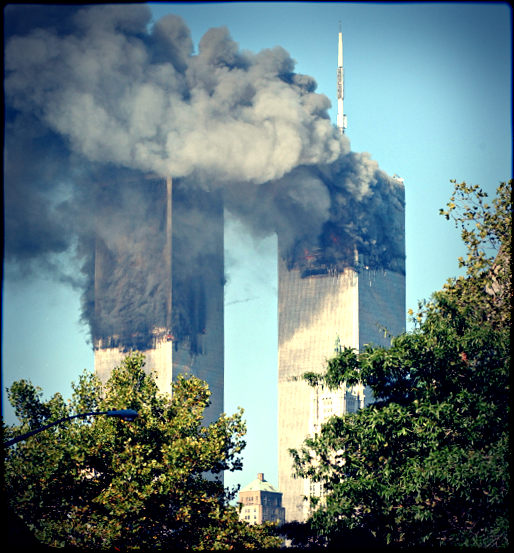 The nation's response to the horrific attacks of 9/11 has been manifested in many areas, including military action, the freezing of terrorists' assets, new diplomatic initiatives, improvements in intelligence gathering, and expanded security measures at airports and other public places. As important as all of these areas are, there is probably no more important policy in preventing future attacks on American soil than the nation's immigration system. Because the current terrorist threat to the United States comes almost exclusively from individuals who arrive from abroad, our system for admitting legal immigrants, temporary visitors, and workers, as well as controlling our borders, is a critically important part of reducing the chance of another attack. While they were the most destructive, the attacks in September were not the first attacks carried out by foreign terrorists on U.S. soil. Including the 9/11 hijackers, 48 foreign-born militant Islamic terrorists (also referred to as Islamist) have been charged, convicted, plead guilty, or have personally admitted in open court their involvement in terrorism within the United States since 1993. Almost all of these individuals are now thought to be linked in some way to Osama bin Laden's al Qaeda organization. This report examines the immigration status of each of these foreign terrorists in an effort to shed light on how we might prevent terrorists from entering and remaining in the country in the future. While other terrorist threats certainly exist, this study focuses on Islamists associated with bin Laden. As the events of 9/11 demonstrated, the scale of the threat posed by him and his organization dwarfs that of any other terrorist group, foreign or domestic. The importance of immigration policy in reducing the terrorist threat is not disputed. President George W. Bush has explicitly acknowledged the central role of immigration policy in reducing the risk of more attacks by creating the Office of Homeland Security. But, in a very real sense we already have a homeland security agency the Immigration and Naturalization Service (INS). In the new war that America finds itself in, any place where immigrants enter the country is a major theater of operation. This is because the primary weapons of our enemies are not tanks, ships, or even commercial airliners, but rather the terrorists themselves thus keeping the terrorists out or apprehending them after they get in is going to be an indispensable element of victory. Simply put, terrorists can't commit an attack on American soil if they are not in the country. Thus, our system for admitting foreign citizens, controlling our land borders and coastlines, and the enforcement of immigration law within the United States have all become as important to protecting America as is the military. While the scale of the 9/11 attacks was far larger than any experienced by the United States in its history, foreign-born, militant Islamic terrorists have carried out a number of terrorist plots on American soil since 1993. The primary goal of this report is to determine how terrorists have entered and remained in the country over the last decade, and also to identify weaknesses or outright failures in America's immigration system so as to make policy recommendations to correct the problems. To be sure, in a nation as large as the United States, it is impossible to prevent terrorists from entering the country 100 percent of the time. However, based on the evidence provided in this report, there are clearly a number of changes that could be made to U.S. immigration policy that would almost certainly lower the chance of terrorists entering and remaining in the country. Moreover, it is important to keep in mind that for changes in policy to be useful in disrupting terrorist attacks, they do not need to work every single time. If only some of the individuals involved in a conspiracy can be identified by consular officers during visa processing, by immigration inspectors when they try to enter the country, or captured trying to cross the border illegally, or picked up when they overstay their visas, it is very possible that whatever conspiracy they are involved in will be uncovered, as was the case with the Millennium plot in December of 1999. In that instance, the apprehension of a single person trying to cross the border caused the entire plot to unravel. Additionally, more careful screening and greatly stepped up enforcement can serve as a deterrent, discouraging terrorists from trying to enter the country in the first place for fear that they will be caught. Of course, domestic terrorist threats exist, and changes in immigration policy will have no effect on home-grown terrorism, nor will it protect Americans abroad from foreign terrorists. The existence of domestic terrorists or even threats to Americans overseas, however, is no reason not to make every reasonable effort to prevent foreign terrorists from entering or remaining in the United States. Moreover, while domestic terrorism may continue to exist, the current threat comes almost exclusively from foreign-born individuals who arrive from abroad. Therefore, focusing on our immigration policy is essential. Most important, the scale of the threat from foreign-based militant Islamic terrorism is also fundamentally different from that posed by other terrorists. Because of its money, organization, international reach, training, fanaticism, desire to obtain weapons of mass destruction, and willingness to inflict maximum death and destruction on civilian and military targets alike, Osama bin Laden's al Qaeda network represents a threat to the United States greater than that posed by any other type of terrorist foreign or domestic. It is therefore critically important that we develop immigration policies to deal with the threat posed by foreign Islamist terrorists. This report concentrates on the immigration status of Islamist terrorists at the time they committed their crimes. Including the 9/11 hijackers, 48 foreign-born militant Islamic terrorists have been charged, convicted, plead guilty, or have admitted their involvement in terrorism within the United States since 1993. Almost all of these individuals are now thought to be linked in some way to al Qaeda.1 Only those who committed at least some of their crimes on U.S. soil are included in the study. Most of the terrorists, other than those killed in the 9/11 attacks, have already pled guilty or been convicted for their crimes. Because there are no implications for immigration policy, we do not include persons who participated in terrorist activity directed at the United States but did so from outside of the country, such as some of the individuals who bombed U.S. embassies in Africa in 1998. However, we do include four terrorists who have been convicted, pled guilty or admitted to their involvement with al Qaeda who were involved in the embassy bombings because they had lived in the United States prior to their taking part in the attacks in Africa. These individuals raised money, recruited new members, or provided other support to the al Qaeda network during their time in the United States. In an effort to provide the reader with background information, below we briefly summarize in chronological order the plots that are included in this study. After each summary, we list the number of foreign terrorists who lived in the United States and took part in each plot. For those who wish more detailed information, numerous published accounts are widely available on each of these incidents. Murder of Two CIA Employees. (Jan. 25, 1993). CIA employees Frank Darling and Lansing Bennett were waiting in traffic outside of CIA headquarters in Langley, Virginia, when they were shot and killed by Mir Aimal Kansi. Three other people were also injured in the attack. Kansi fled to Pakistan but was apprehended in June 1997. He was sentenced to death in January 1998 for the murders. Number of foreign terrorists involved: 1. First Attack on World Trade Center. (Feb. 26, 1993) A bomb consisting of 1,200 pounds of explosives in a rental van was detonated in the basement garage of the south tower of the World Trade Center, killing six and injuring more than 1,000 people. The attack also caused $500 million in damage. Six individuals were later convicted for their direct role in the crime. Each received a 240-year sentence. The attack was later revealed to be part of a larger conspiracy involving a terrorist cell led by radical Islamic cleric Sheik Omar Abdel Rahman. In addition to the six individuals convicted for their direct involvement in the plot, Mohammed Abouhalima, whose brother was a leader of the plot, was convicted in 1997 for helping him flee to Egypt after the attack. One native-born American, Abdul Rahman Yasin, has been indicted and is still at large. Number of foreign terrorists involved: 7. Plot to Bomb New York Landmarks and Assassinate Political Leaders. (June 24, 1993) Eight men were arrested for planning a series of terrorist attacks in and around New York City. Several other individuals were later arrested for their roles in the plot. The attacks were planned as a follow up to the World Trade Center bombing in January of that year. Sheik Omar Abdel Rahman was at the center of the conspiracy. The targets included the United Nations building, FBI headquarters in Manhattan, the Holland and Lincoln tunnels, and the George Washington Bridge. The terrorists also planned to assassinate a number of political figures, including then-UN Secretary General Boutros Boutros-Ghali and Egyptian president Hosni Mubarak. Rahman and several other terrorists were convicted in October 1995, while several others plead guilty earlier. Sentenced in January of 1996, the terrorists received sentences ranging from 25 years to life in prison. Three native-born American converts to militant Islam also participated in the conspiracy. Number of foreign terrorists involved: 11. Plot to Bomb the New York Subway. (July 31, 1997) Tipped off by an informant, police raided a Brooklyn apartment and found pipe bombs filled with gunpowder and nails. Two men were arrested and charged with planning to bomb a packed rush-hour subway train in Borough Park, New York. Gazi Ibrahim Abu Mezer was found guilty for his role in the plot and sentenced to life in prison. Lafi Khalil was acquitted of direct involvement in the bomb plot but was found guilty of immigration fraud and sentenced to three years in prison. In sentencing Khalil to three years for immigration fraud, Brooklyn federal court Judge Reena Raggi said she believed Khalil knew about the bombing plans but was not sure if he was part of the conspiracy. Number of foreign terrorists involved: 2. U.S. Embassy Bombing in Tanzania and Kenya. (Aug. 7, 1998) Almost simultaneous truck bomb explosions at the American embassies in Dar es Salaam, Tanzania, and Nairobi, Kenya, killed 224 people, including 12 Americans, and wounded more than 4,000 others. Some 20 al Qaeda members are thought to have taken part in the bombings. At least three of those involved in the bombings were naturalized American citizens who lived and worked for Osama bin Laden's al Qaeda organization while in the United States. In addition, Essam al Ridi, who is also a naturalized American citizen, testified against several individuals involved in the plot. He also admitted to having worked for bin Laden while in the United States, including purchasing and personally delivering a jet plane to the al Qaeda leader. The plane was to be used for transporting missiles from Afghanistan to the Sudan. Number of foreign terrorists involved: 4. Millennium Plot to Bomb Los Angeles International Airport. (Dec. 14, 1999) Using a fraudulently obtained Canadian passport, Ahmed Ressam tried to cross the border from Canada at Port Angeles in Washington State. A border inspector felt he looked nervous, and a search of his car turned up a trunk full of bombs. There is some debate about the exact target(s) of the attack; however, it seems likely that Los Angeles International Airport and perhaps millennium celebrations in Seattle were the intended targets. Several individuals living in Canada were also involved in the plot. Convicted in April 2001, Ressam was sentenced to life in prison. Abdelghani Meskini, who was to meet up with Ressam in Seattle, pleaded guilty to his involvement and has testified against others in the plot. Abdel Hakim Tizegha, who also played a supporting role in the conspiracy, was allowed to plead guilty to immigration fraud in return for his agreeing to testify against other participants. Number of foreign terrorists involved: 3. Second Attack on the World Trade Center. (Sept. 11, 2001) Four commercial airliners were hijacked by 19 terrorists, two planes were crashed into the towers of the World Trade Center, one hit the Pentagon in Arlington, Virginia, and a fourth crashed in a field in western Pennsylvania after the passengers attempted to regain control of the aircraft. Roughly 3,100 people on the planes and in the buildings were killed in this, the worst terrorist attack in American history. Zacarias Moussaoui, who may have been the 20th hijacker, was already in custody for immigration violations when the attacks took place; he is the only person so far to be charged with direct involvement in the conspiracy. Number of foreign terrorists involved: 20. In this section we examine the immigration status of terrorists to see what means they used in the last decade to enter and remain in the country. The analysis below will show that practically every immigration status can be found to have been exploited by the terrorists. Foreign Islamist terrorists have entered as students, tourists, and business visitors. They have also been lawful permanent residents (green card holders) and naturalized U.S. citizens, allowed into the country because they had a family member in the United States. Illegal aliens also figure prominently in almost every major terrorist attack of the last decade. Additionally, terrorists have even used America's humanitarian tradition of welcoming those seeking asylum as a means of remaining in the country so they could attack the United States. Table 1 (p. 11) reports the immigration status at the time individuals committed their crimes for the 48 terrorists in the study. The figure reveals the highly eclectic nature of the terrorist threat in terms of our immigration system. In the wake of 9/11, some observers have focused on temporary visa holders such as students, while others have pointed to illegal immigration as the primary problem. The figure makes clear, however, that no one type of immigration can be said to represent the gravest threat. Every aspect of the U.S. immigration system has been penetrated by terrorists. The information for Table 1 is found in Tables 2 through 8. The tables report the name, immigration status, country of birth, and some biographic information on each of the 48 terrorists in the study. The tables provide most of the information used in the study. Rather than footnote every source in the text, the sources for immigration histories of each terrorist are found in the references for the tables (p.65). Virtually all of the information in this study is public knowledge and can be easily accessed from open sources listed in the end notes. The tables are organized chronologically based on the date of the terrorist plot. 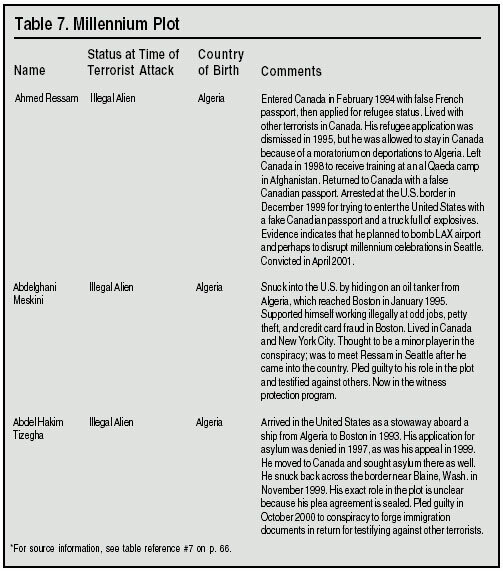 The biographic information in the tables focuses on individuals' immigration history and their role in the terrorist plot in which they were involved. The events of 9/11 have called attention to the nation's temporary immigration system (also called the nonimmigrant system) because all of the hijackers entered the country using temporary visas, and 16 of the hijackers were still legally in the country on 9/11. The temporary immigration system includes tourists, business travelers, students, and guest workers as well as a number of specialized categories for everything ranging from fashion models to journalists. To be a nonimmigrant one must, normally, first obtain a visa from an American consulate overseas, indicating that one has met the criteria for a visit to the United States. Citizens of certain advanced industrial democracies, mostly in Asia and Europe, can enter and stay in the United States for up to 90 days without a visa. These countries are part of what is called the visa waiver program. When a citizen of a foreign country (with a visa or from a visa waiver country) arrives in the United States, an inspector from the Immigration and Naturalization Service (INS) stamps his passport indicating how long he is allowed to remain in the country. Lengths of stay can vary greatly depending on the type of visa.2 In many cases, a person can re-enter the country numerous times on the same visa because most are valid for five years. September 11th Hijackers Had Valid Temporary Visas. The tables reveal that the 9/11 hijackers are not the first Islamist terrorists to have entered using the nation's nonimmigrant system. However, they are the first to have been within their authorized period of stay when they committed their crimes. That is, a number of terrorists had entered the country using temporary visas, but these earlier, nonimmigrant terrorists had either become illegal aliens because they overstayed their visas, become asylum applicants, or had become Lawful Permanent Residents by the time they took part in terrorist activity. The fact that 16 of the 9/11 hijackers were the only militant Islamic terrorists to have had valid temporary visas when they committed their crimes suggests that it may not be easy to abide by the terms of a nonimmigrant visa, particularly its length of stay, and still engage in terrorist activity. This may be due to the fact that it takes time to plan and execute a sophisticated plot, and many terrorists in the past have simply overstayed their visas before they could commit a terrorist act. Other Terrorists Who Originally Entered on Temporary Visas. In addition to the 16 hijackers who were in the country legally on temporary visas on 9/11, at least 17 other militant Islamic terrorists in the last decade originally entered the country using nonimmigrant visas. Seven of the 16 were permanent residents by the time they took part in terrorism, having obtained green cards. Of those seven, at least four lived in the United States illegally prior to obtaining legal status, including Fadil Abdelgani, who took part in the plot to bomb New York landmarks and had received his green card through a sham marriage to an American citizen, and his co-conspirator Amir Abdelgani. It also includes Mahmud Abouhalima, convicted for his role in the first World Trade Center attack and his brother Mohammed. Both entered on tourist visas and stayed beyond their allotted time; they lived in the country illegally for a number of years before gaining permanent residence by falsely claiming to be agricultural workers to qualify for green cards as part of an amnesty passed by Congress in 1986. In addition, Ali Mohammed, Khaled Abu-Dahab, and Wadih al Hage entered on temporary visas and later married American women. It is not clear whether any of these three embassy bombers ever lived illegally in the United States. Many Who Entered on Temporary Visas Later Became Illegal Aliens. Excluding the seven of 16 who were legal permanent residents by the time they took part in terrorism, the nine remaining terrorists who had originally entered on temporary visas had become illegal aliens or asylum applicants by the time they took part in terrorism, including: four of the 9/11 hijackers; Mir Aimal Kansi, who murdered two CIA employees in 1993; Sheik Omar Abdel Rahman, who lead the plot to bomb New York City landmarks; Mohammed Salameh and Eyad Ismoil, two conspirators in the first Trade Center bombing; and Lafi Khalil, who was involved in the plot to bomb the Brooklyn subway system in 1997. Kansi and Rahman were both asylum applicants when they were arrested. Sheik Rahman, who used a tourist visa, is probably the most important terrorist prior to 9/11 to enter the country originally as a nonimmigrant. He subsequently obtained permanent residency by qualifying as a minister of religion using a false name. His permanent residency was revoked because he lied on his applications. He then applied for asylum to prevent deportation. His application was pending at the time of his arrest. Rahman inspired both the first World Trade Center attack as well as the plot to bomb New York City landmarks. Moreover, he is widely considered to be one of the spiritual leaders whose ideas helped to found al Qaeda. While none of 9/11 hijackers used the permanent immigration system, Lawful Permanent Residents (LPR), also referred to as green card holders, and naturalized citizens have been involved in past terrorist attacks. In fact, LPRs and naturalized U.S. citizens comprise one-third of all militant Islamic terrorists over the last decade. Of the 48 terrorists in the study, 17 were either LPRs or former LPRs who had become naturalized U.S. citizens by the time they committed their crimes. The nation's permanent immigration system admits between 700,000 and 900,000 people a year. It is composed of three main categories.3 By far the largest category is those who have a relative in the United States. The second largest category admits those who are allowed in because they have a job offer or some specialized skill. Refugees and those granted asylum comprise the third main category. In most cases permanent immigrants must first obtain a visa from an American consulate overseas indicating that they have met the criteria to live in the United States permanently. However, in recent years, roughly half of all immigrants issued green cards originally entered on temporary visas or illegally crossed the border and later adjusted to permanent status within the United States. A significant number of these adjustments are illegal aliens adjusting to legal status. Naturalized Citizens Have Been Some of the Worst Terrorists. 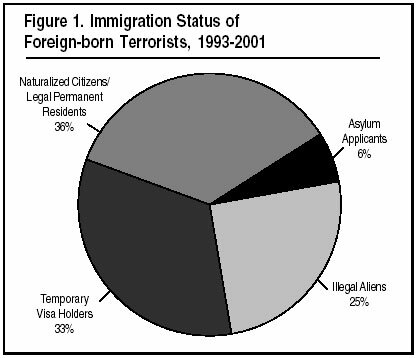 During testimony before the Immigration subcommittee in the Senate on October 17, 2001, INS commissioner James Ziglar stated Immigrants are not terrorists. . . The people that we are talking about, the hijackers, they weren't immigrants. They were nonimmigrants. While it is certainly correct that the 9/11 hijackers were nonimmigrants, the commissioner is incorrect if his comments are meant to indicate that permanent residents are not a source of terrorism. In fact, prior to 9/11, most foreign terrorists were, in fact, LPRs or nationalized U.S. citizens. Excluding the 9/11 terrorists, more than half (17 out of 28) of the militant Islamic terrorists in the last decade were persons living legally in the United States as permanent residents or as naturalized citizens. The tables clearly show that terrorism is not something only associated with temporary immigration. 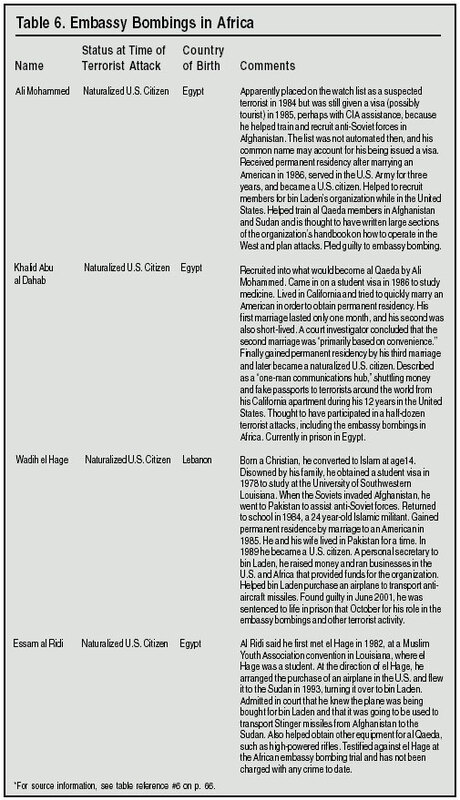 The study found that there were six al Qaeda terrorists who were naturalized U.S. citizens. Some of the worst foreign terrorists have been naturalized citizens. For example, El Sayyid Nosair, who assassinated Rabbi Meir Kahane in 1990 and is one of the earliest militant Islamic terrorists in the United States, is a naturalized U.S. citizen. He was later convicted as part of the larger conspiracy to bomb landmarks around New York City. Nidal Ayyad, a chemical engineer who provided the explosive expertise for the first World Trade Center bombing in 1993, was also a naturalized U.S. citizen. Egyptian-born Ali Mohammed, who is widely regarded as having written al Qaeda's terrorist handbook detailing how to pick targets and operate in the West without detection, and who was involved in terrorism as far back as the 1993 World Trade Center bombing, is also a naturalized U.S. citizen. And Khalid Abu al Dahab, described as a one-man communications hub, shuttling money and fake passports to terrorists around the world from his California apartment, is another naturalized American citizen. Many Terrorists Have Been Lawful Permanent Residents. Lawful Permanent Residents (LPRs) who were not yet citizens have also played an integral role in terrorism. In all, 11 LPRs have been convicted or pled guilty to their involvement in terrorism, including Mahmud Abouhalima, one of the leaders of the first World Trade Center bombing, who became a legal resident after falsely claiming to be an agricultural worker, allowing him to qualify for a green card as part of an amnesty passed by Congress in 1986. Another LPR was Mohammed Saleh, who provided the money and the fuel oil needed to create the bombs for a massive terrorist plot around New York City, one that included plans to bomb the United Nations building, FBI headquarters, the Holland and Lincoln Tunnels, and the George Washington Bridge. The plan, had it been carried out, not only would have killed many Americans but also would have completely disrupted commerce in and around New York City. Nine other foreign-born terrorists involved in the same plot were also green card holders. Humanitarian-based immigration consists of two main parts: refugees and those granted asylum. In most cases, refugees are persons living outside of their home country who cannot return home because they either have been persecuted or have a well-founded fear of persecution. The State Department vets the claims of refugees while they are still overseas. In contrast, asylum applicants apply after they have arrived in the United States, at a port of entry, or after being admitted on a temporary visa or after they crossed the border illegally. Both asylees and refugees are supposed to meet the same criteria. In recent years, 75,000-100,000 refugees have been admitted to the United States, and although 50,000-75,000 individuals apply for asylum in most years, only 10,000-15,000 ultimately are awarded asylum. Several Terrorists Have Been Asylum Applicants. Three of the 48 terrorists in this study were asylum applicants at the time they took part in terrorism. 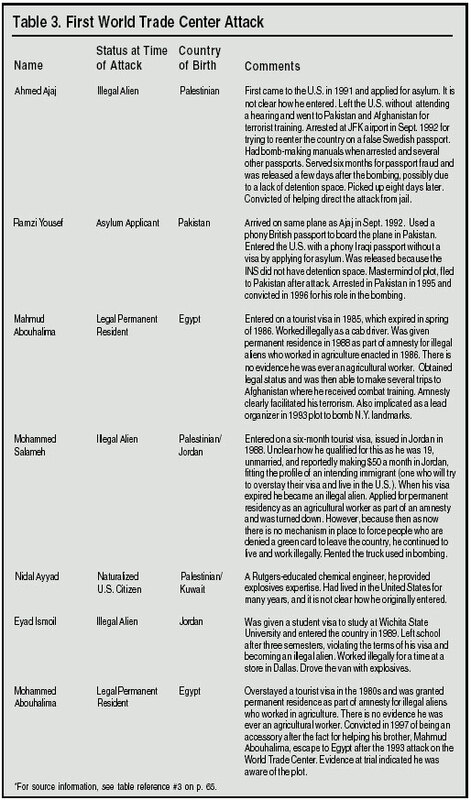 Some of the most notorious terrorists in the 1990s used political asylum to enter and/or remain in the country. Sheik Omar Abdel Rahman, for example, used an asylum application to prevent his deportation to Egypt after all other means of remaining in the country had failed. Mir Aimal Kansi, who murdered two CIA employees, and Ramzi Yousef, who was sentenced to death for masterminding the first attack on the World Trade Center, both had applications for political asylum pending when they committed their crimes. Terrorists Have Used Asylum to Remain in the Country. Rahman, Kansi, and Yousef are not the only terrorists to use the asylum system to forestall deportation. Abdel Hakim Tizegha, who took part in the Millennium plot in 1999, Gazi Ibrahim Abu Mezer, who planned to bomb the New York subway in 1997, and Ahmad Ajaj, who took part in the first World Trade Center attack, all at one point applied for asylum as a means of remaining in the country illegally. Tizegha's application had been denied prior to his arrest; Mezer eventually dropped his application, telling the judge though his lawyer that he was returning to Canada; and Ajaj left the country before attending a hearing but later returned and took part in the first attack on the World Trade Center. All three men used the asylum system to remain in the country illegally and prevent their deportation. In total, at least 6 of the terrorists in the study had used the asylum system at some point. Being in the country illegally has also been a common status among terrorists. Of the 48 Islamist terrorists in the last decade, 12 were in the country illegally when they committed their crimes. In fact, illegal aliens have taken part in almost every major attack on U.S. soil perpetrated by Islamist terrorists, including the first attack on the World Trade Center, the Millennium plot, the plot to bomb the New York subway, and the attacks of 9/11. It may also be more accurate to include asylum applicants in the category of illegal aliens, because all three terrorists who had applications pending (Kansi, Rahman, and Yousef) had no legal basis for being in the United States and were awaiting the outcome of the asylum process. If these three individuals are deemed illegal aliens, then illegals have taken part in every major attack or planned attack on U.S. soil since 1993. Moreover, as has already been mentioned, Mahmud and Mohammed Abouhalima, and Fadil and Amir Abdelgani, lived in the United States illegally before gaining legal status. If the asylum applicants are included, along with the Abouhalima brothers and the Abdelganis, then at least 19 of the 48 terrorists in this study were either illegal at the time they took part in terrorism or had lived in the United States illegally for an extended period before they took part in a terrorists attack. Khalid Abu al Dahab also violated immigration laws because he clearly married a number of American women in rapid succession with the intent of gaining a green card. Finally, Mohammed Atta and Marwan al Shehhi used temporary visas to live in the United States for nearly a year and a half, a clear violation of immigration law. Between the spring of 2000, when they entered the country and 9/11, both lived almost continuously in the United States spending no more than three weeks abroad. In sum, 22 Islamist terrorists in the last decade have violated U.S. immigration law at some point. This certainly suggests that strict enforcement of immigration law could disrupt terrorist attacks in the future. Most Illegal Alien Terrorists Overstayed Their Visas. Most of the terrorists in the country illegally when they committed their crimes had overstayed temporary visas. Of the 12 who were illegal aliens when they took part in terrorism, seven were visa overstayers. These include two conspirators in the first World Trade Center attack, Mohammed Salameh and Eyad Ismoil. Others who took part in terrorism and had overstayed visas were Lafi Khalil, who was involved in the New York subway bomb plot, and four of the 9/11 terrorists: Zacarias Moussaoui 4, Satam al Suqami, Nawaf al Hamzi, and Hani Hanjour. Some Illegal Alien Terrorists Crossed the Border Illegally. Overstaying a non-immigrant visa is not the only way illegal alien terrorists have entered and remained in the country. Subway bomber Gazi Ibrahim Abu Mezer was caught trying to sneak across the Canadian border, and because of a lack of detention space, he was paroled into the U.S. Abdelghani Meskini and Abdel Hakim Tizegha, who both took part in the millennium plot, had been stowaways on ships from Algeria at different times. After having been denied asylum, Tizegha moved to Canada, but he later returned to the United States by sneaking across the Washington state border. Two other terrorists tried to enter the country illegally using false passports: Ahmad Ajaj, who tried to enter using a false Swedish passport and was detained at JFK airport, and Ahmed Ressam, who was caught at the Canadian border trying to enter using a false Canadian passport. Clearly, overstaying a visa is not the only way terrorists with no legal right to be in the country have tried to enter or remain in the United States. A Wide-Ranging Threat. The analysis above has demonstrated that al Qaeda terrorists have used almost every conceivable means of entering and remaining in the United States. Those involved in terrorism have crossed the border illegally, arrived as stowaways on ships, used false passports, and have used both the nation's temporary and permanent immigration systems. The fact that different ways of entering the country have been used by terrorists means that our response must be multi-faceted. We cannot focus on just one area and think that improved border controls, for example, or more careful screening of temporary visas will be sufficient. If the United States is to be protected, every aspect of our immigration system, including borders, ports of entry, visa processing, and enforcement of immigration laws must be improved. Of course, no set of policy changes and reforms will stop every terrorist every time, but clearly a great deal more must be done if we are to reduce the chance that terrorists will successfully carry out another major attack. Making the country much safer does not mean the system has to be totally fool-proof. If only a few individuals involved in a conspiracy can be caught, then the entire plot often can be unraveled. The fact that terrorists have used every type of immigration to enter the country is an important finding. It means that our response must encompass the totality of the U.S. immigration system. But that is not the only challenge the nation faces with regard to immigration. Our immigration system itself has serious weaknesses that have made it easier for terrorists to enter the country. These weaknesses, and in some cases outright failures, have on a number of occasions made it easier for Islamist terrorists to enter easily and remain in the country. The section below examines the three main parts of our immigration system: 1) visa and green card issuance; 2) the border and ports of entry, and; 3) interior enforcement of immigration laws. A number of factors have contributed to making the country more vulnerable to terrorism: the inadequate vetting of visa applicants, lack of cooperation between agencies in the government and between U.S. and foreign governments, failure to adequately police the borders, and a complete lack of interior enforcement. While many of the problems identified below are not exclusive to terrorists, what follows is an examination of how problems in each of these areas have facilitated terrorism on United States soil. In a very real sense, Foreign Service officers serve as an extension of America's border patrol system. It is they who determine, in most cases, who is allowed into the country. With the possible exception of six terrorists Yousef, Ajaj, Mezer, Ressam, Meskini, Tizegha, and Moussaoui 41 of the 48 terrorists in the study had been approved for a visa by an American consulate overseas at some point. The fact that so many terrorists made it through the visa processing system does not mean that in every case the system should have quickly identified the terrorist applicant and prevented him from getting a visa, but it certainly suggests that there are significant problems in the system. The primary tool in flagging terrorists is called the watch list or lookout system, which is a compilation of several million people who are not to be issued visas or otherwise allowed to enter the country. The current system is based on names, date of birth, country, and passport numbers rather than a biometric identifier such as a photograph or fingerprint. The names of persons applying for visas are checked against the list. In some cases, failure to follow procedure and outdated technology have caused the system to fail. However, not every failure is the result of the INS or the State Department failing to use the watch list or do their jobs properly. In fact, in a number of cases, it appears that U.S. intelligence agencies or foreign governments did not inform the INS and State Department that an individual might be a security risk. Sheik Rahman and Ali Mohammed Were on the Watch List but Still Received Visas. Probably the most infamous person to be issued a visa who should not have been is Egypt-born Sheik Omar Abdel Rahman. Rahman was a well-known public figure in his home country, and his direct links to terrorists, including those who assassinated Egyptian President Adwar Sadat, as well his extremist anti-Western ideology, were long standing. Although apparently on the watch list, Rahman was still issued a tourist visa because a consular employee in Khartoum, Sudan, did not properly check the list. Although most large corporations had computerized their databases by the mid-1980s, most consular offices were still using microfiche to store and search names on the watch list. This made it much more likely that a name could be missed. Allowing Rahman into the country was a major failure because had he not been granted a visa, he would not have been able to inspire both the first attack on the World Trade Center and the plot to bomb New York landmarks in 1993. While the circumstances are not entirely clear, Ali Mohammed was apparently placed on the watch list in 1984 but was still able to get a visa (possibly tourist) in 1985 from an American embassy in Cairo. The list was not automated at the time, and his extremely common name may account for his being issued a visa. He eventually married an American and lived in the United States for many years working for al Qaeda, helping to plan a number of attacks, including the first attack on the World Trade Center and the bombing of American embassies in Africa. Learning the names of al Qaeda terrorists is an enormous intelligence challenge, but in the case of Sheik Rahman and Ali Mohammed, whose links to terrorism where known, it is absolutely imperative the system keep those individuals out of the country. Foreign Governments Fail to Inform the U.S. of Known Terrorists. Mahmud Abouhalima and Zacarias Moussaoui are two individuals whose links to terrorism were known to U.S.-friendly governments in their home countries. As a teenager, Mahmud Abouhalima became involved with the outlawed al-Jama'a Islamiyya, an extremist Islamic organization. He had been under surveillance by the Egyptian government, and a number of his associates were imprisoned prior to his 1981 departure for Germany. Because his name was not on the watch list, Abouhalima was granted a tourist visa in 1985 by an American consulate in Germany. Zacarias Moussaoui's circumstances are similar. According to published reports, Moussaoui was known as a possible terrorist to French authorities, but, again, his name was not on the U.S. watch list. As a French citizen Moussaoui was able to easily enter the United States because France is part of the visa waiver program, which allows people to enter the United States and stay for up to 90 days without a visa. He did apparently apply for a change of status to a student visa while attending flight school in Oklahoma. Of course, had his name been on the watch list, he might have been stopped at a port of entry by an immigration inspector. It is unknown whether U.S. intelligence was aware of Abouhalima or Moussaoui, but what is clear is that although U.S. allies were aware of both men's possible links to Islamic extremists, their names never made it on to the watch list. Getting the names of possible terrorists from foreign governments must become a top priority of the American intelligence community as well as both the State Department and INS. CIA and FBI Reluctance to Share Information May Have Helped Terrorists. For a number of years the State Department and the INS have complained that the intelligence agencies and FBI have not been entirely forthcoming with the names of suspected terrorists, partly because they fear sources might be compromised. The case of Khalid al Midhar, who may have piloted American Airlines Flight 77 into the Pentagon, shows why information-sharing must improve. Al Midhar's terrorist activities were not known to U.S. authorities when he received his business visa in Saudi Arabia in 1999 or when he entered the country for the first time in January 2000.5 (He left in June 2001.) In January 2001, while al Midhar was out of the country, the CIA became aware that he was involved in the attack on the USS Cole the year before. However, his name was not placed on the watch list until August 2001. Unfortunately, he had already re-entered the United States in July. The fact that it took the CIA several months to put al Midhar's name on the watch list indicates that, at the very least, putting the names of terrorists on the list was not the high priority for the CIA that it should be. It must be pointed out that al Midhar's visa allowed for multiple re-entries. However, the watch list could still have been effective because if his name was part of the lookout system then an INS inspector at the port of entry could have detained him. Of course, in many cases, the INS does not check the names of all persons entering the country due to limited personnel and time constraints. This is especially true at ports of entry along the borders. This will hopefully change in the near future. The key issue in regard to al Midhar is that the CIA did not provide information to the INS and State Department in a timely fashion. Without question, providing the INS and State Department with as much information as possible as soon as possible will make the watch list a more useful tool in reducing terrorism. Brief Interview at Consulate Allowed Lafi Khalil Into the Country. Lafi Khalil was involved in the plot to bomb a New York City subway station in 1997. Although the extent of his guilt is not totally clear, the way in which his visa was processed points to a number of problems with how consular officers interview applicants. In November 1996, Khalil received a C-1 a transit visa from the U.S. Consulate in Jerusalem for travel through the United States to Ecuador. A subsequent investigation found that Khalil had been interviewed only briefly by a consular officer, and the officer did not require him to produce a plane ticket for Ecuador nor to demonstrate that he had funds for the trip. The officer also did not consider requiring him to catch a connecting flight in transit without visa status, which would have required him to stay in the airport.6 Khalil appears never to have had any intention of going to Ecuador. After he cleared immigration inspection he boarded a flight to Syracuse, New York, and remained in the United States until his arrest in July 1997. However, this would not have been possible had the consular officer verified Khalil's story or had simply not granted him a transit visa. The brief and ineffective nature of most interviews by consular officers and the failure of the officer in the Khalil case to make an attempt to verify his story, allowed Khalil to receive a temporary visa, which he used to live in the United States illegally. Clearly, if we are to increase the chance that an applicant who plans to commit terrorism or other crimes is detected, then it will require longer in-person interviews and much more careful scrutiny of applicants. Three September 11th Terrorists Were Never Interviewed by Consulate. As the case of Lafi Khalil indicates, an inadequate consular interview has significant consequences. Perhaps even worse, some terrorists were never interviewed by a consular officer at all. The December 24, 2001, issue of U.S. News and World Report reported that three of the 9/11 hijackers obtained their visas using a system called Visa Express, which is used by the American consulates in Saudi Arabia to speed up the visa application process. Those seeking a visa submit their applications and supporting documents through a designated travel agency. Although the application is reviewed at the consulate and the names are run through the watch list, the applicants are never interviewed by a consular officer. According to U.S. News, hijackers Abdulaziz Alomari, Salem al Hamzi, and Khalid al Midhar all used the Visa Express system. By not having an in-person interview, the issuing officer cannot be sure that the person applying for the visa is actually the person in the submitted documents and application. Moreover, by not meeting with the applicant, it makes it much more difficult to detect deception and fraud. The entire Visa Express system seems to have been set up with the intent of making things easier for applicants and to reduce the workload of the consulate. The protection of the American people does not seem to have been a priority. Such a system seems completely inappropriate in a country where, even prior to 9/11, it was well known that a big share of the population was sympathetic to bin Laden's ideology. Some Terrorists Have Characteristics of Intending Immigrants. Section 214(b) of the Immigration and Nationality Act states that every alien shall be presumed to be an immigrant until he establishes to the satisfaction of the consular officer . . . that he is entitled to nonimmigrant status. Individuals who appear likely to overstay their temporary visa are called intending immigrants. That is, they will try and settle permanently in the United States. Consular officers are not to issue nonimmigrant visas unless the applicant can demonstrate that he has a residence abroad to which he is likely to return (with some exceptions), that the visit to the United States will be temporary, and that the applicant has enough money to finance the visit and return trip. Officers are trained to look for evidence of strong ties to the applicant's home country, such as family, a good job, property, and other things that would increase the likelihood that an applicant will return, and to be skeptical of applicants who fit the profile of a probable illegal visa overstayer. The criteria vary from country to country, but these individuals are generally young, unemployed or earning a low income, and unmarried. Section 214(b) is by far the most common reason for applications to be refused in 1998, the most recent year for which statistics are available, 78 percent of nonimmigrant visa refusals fell into this category. An individual who applies outside his country of nationality should invite additional scrutiny, according to consular regulations and training manuals. Often these applicants are the ones who have real difficulty establishing ties to their home country or to the country in which they now live. While, by law, consulates must adjudicate the applications of anyone physically present in their district, in many situations it is considered most appropriate to refuse the application under Section 214(b) and advise the applicant to apply in his home country, under the assumption that consular officers there are in a better position to assess the merits of the application. Published accounts suggest that a number of the 9/11 hijackers should have been refused a nonimmigrant visa under Section 214(b). For example, Mohammed Atta spent most of the 1990s outside of his home country of Egypt studying in Germany. At the time of application, Atta was single, unemployed, and had lived in Germany for the last seven or eight years. It is hard to imagine how he could have overcome the mandatory presumption of immigrant intent and it is entirely reasonable to question seriously the judgment of the consular officer who approved the visa. It appears that at least three other 9/11 hijackers, who provided the muscle to overpower the flight crews, should also have been denied visas under 214(b). While information is not complete, Mohand al Shehri, Majed Moqed, and Ahmed al Haznawi were all reportedly in their early 20s, unmarried, and seem to have had little income. The 9/11 hijackers are not the only militant Islamic terrorists who could have been excluded as intending immigrants. Mohammed Salameh was given a tourist visa in 1988 despite the fact that he was only 19 years old, unmarried, and reportedly making $50 a month in Jordan. Persons with families, property, and other commitments in their home countries are less likely to be part of a terrorist plot, especially one that involves suicide. They are also less likely to be intending immigrants. More educated individuals like Atta who have lived outside of their home countries also fit the terrorist profile and of intending immigrant. Many senior members of Islamic extremist movements live outside of their own countries (primarily in the West) because the security services in most Muslim countries have crippled their organizations at home. Applying for Visas from a Third Country May Have Helped Terrorists. A number of terrorists have applied for visas from countries other than where they were born. Sheik Rahman, an Egyptian, was granted a visa from the American embassy in Sudan. Mahmud Abouhalima and Mohammed Atta, who were also Egyptian citizens, both obtained visas in Germany. So did 9/11 hijacker Ziad Jarrah, who was from Lebanon. The fact that their visas were processed by consulates outside their home countries may have made it easier for these terrorists to slip past consular officers. For example, Rahman, well known in Egypt, significantly reduced his chance of being recognized by going to Sudan. Applying in a third country may be helpful to terrorists because consular officers may not speak the language or be familiar with conditions in the applicant's home country. This cannot help but reduce the chance that an implausible or fraudulent story will be detected. It is also important to keep in mind that most governments in the Middle East have suppressed Islamist movements. And somewhat paradoxically, it is often in the West where members of such movements congregate. American consulates in western countries are therefore very likely to process visa applications from possible Islamist terrorists. But, they are also much less equipped to evaluate such applications. Requiring all applicants, or at least those from the Middle East, to return to their home countries is one possible reform that would enhance the security of the United States. Another possibility would be to forward all applications from the Middle East to a consulate in their home country. Several Terrorists Entered the United States Multiple Times. While by no means true in every case, a number of terrorists, including some of the 9/11 hijackers, entered and left the United States more than once using the same temporary visa. Mohammed Atta and Sheik Rahman, probably the two most notorious Islamic terrorists in American history, both used temporary visas to enter the United States several times. 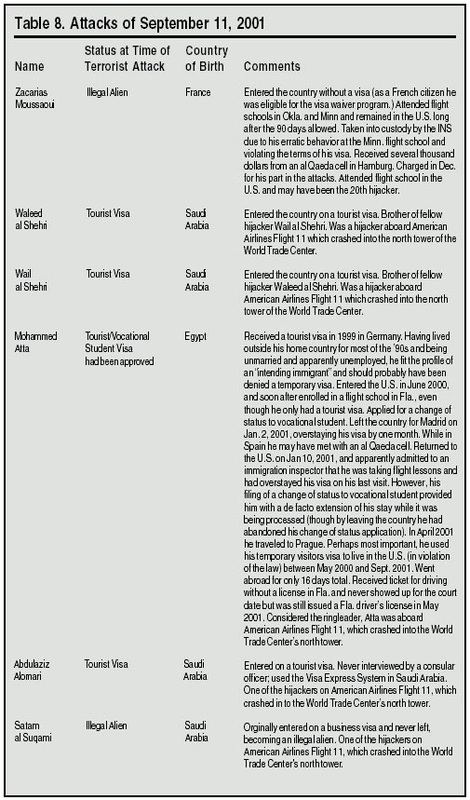 9/11 hijackers Marwan al Shehhi, and Khalid al Midhar also entered the country more than once. Hijacker Hani Hanjour's first visit to the United States seems to have been in 1990, when he came to the country for an eight-week English course at the University of Arizona. Throughout the 1990s he left the country more than once and took classes at several flight schools in different states. In many cases, planning an operation often requires terrorists to leave in order to meet with other members of their organization perhaps to plan the attack, receive money, or exchange information. These multiple entries are important for two reasons. First, they indicate that prior visits without incident do not indicate that a person has no hostile intentions. Therefore, each applicant for a visa must be carefully scrutinized. Of course, Atta, al-Shehhi, al-Midhar, and Rahman used the same visa each time they entered and did not have to return to the consulate for a new one. However, this does not change the basic fact that they came to the United States a number of times before they ultimately committed their crimes. The second reason multiple visits are important is that in some cases, such as Khalid al Midhar, we might learn that a person is a terrorist in between their stays in the United States. For this reason, it is very important to update the watch list as often as possible and create a reliable system that is available to INS inspectors at every port of entry. That way, the list could be used to stop someone like al Midhar when he tries to reenter the country. Terrorists Have Been Issued Green Cards Within the United States. A number of terrorists over the years have been issued green cards (permanent residency) after they have lived in the United States for some time, in many cases illegally. Sheik Rahman received a green card in January 1991 using a false name after first entering the country on a tourist visa. He was given permanent residency as a minister of religion, which is part of employment-based immigration. Permanent residency allowed him to stay in the country as long as he wished, leave and return as often as he liked, hold a job, and eventually become a United States citizen. Thus, by giving him a green card, the INS significantly enhanced his ability to engage in terrorist activity. Partly for this reason, when it realized he had used fraudulent means to get permanent residence, the INS revoked it in March 1992. Fadil Abdelghani, who took part in the plot to bomb New York landmarks, had overstayed a tourist visa in 1987. He obtained permanent residence in 1991 through a sham marriage to an American. As we have seen, the Abouhalima brothers also fraudulently obtained their green cards by claiming to be agricultural workers when in fact they never worked in agriculture. In each case, careful scrutiny might have increased the chance that Abdelgani's, Rahman's, or Abouhalima's fraud would have been discovered. Unfortunately, the INS simply does not have the resources to investigate carefully each green card application. While many applicants have to wait a long time to receive their green cards, this is not indicative of the thoroughness of background checks or attempts to verify a story; rather, it reflects the enormous workload of the INS which creates a very large backlog. The previous sections of the report have shown that there are a number of instances in which weaknesses in the way visas and green cards are issued have helped terrorists enter the United States. In this section of the report we examine how lax border enforcement and problems at ports of entry have also facilitated the entry of militant Islamic terrorists associated with al Qaeda. Almost Every Terrorist Had Contact with an Immigration Inspector. The nation's ports of entry are the places where people traveling by land, sea, or air legally enter the United States. These entry points are staffed by immigration and customs inspectors. With the exception of three terrorists Tizegha, Meskini, and Mezer 45 of the 48 terrorists in the study had contact with an inspector at a port of entry. Inspectors are an important line of defense and historically have had some success in preventing terrorists from coming into the United States. The millennium plot was averted when Ahmed Ressam was stopped by an inspector at the border the officer thought Ressam looked nervous. And Ahmad Ajaj was placed in detention when an inspector realized he was trying to enter the country on a fake Swedish passport although he still took part in planning the first World Trade Center attack from his jail cell. The cases of Ahmed Ressam and Ahmad Ajaj show why a careful inspection at the port of entry is critical to homeland security. Ressam carried a fraudulent Canadian passport, and Ahmad Ajaj had a false one from Sweden. In both cases their passports would have allowed them to enter the country without a visa. Sweden is part of the visa waiver program and Canadians can also enter the country without a visa. The immigration inspection is an opportunity to stop terrorists. But only by having the inspector talk to the person from a visa waiver country and examining his passport carefully is it possible to detect a problem. Moreover, the case of Zacarias Moussaoui, a French national, shows that terrorists can in fact be genuine citizens of visa waiver countries and not simply possess a fake passport from a waiver country. Inspectors at Ports of Entry Do Not Always Check the Watch List. While a careful inspection at the port of entry can and has caught terrorists, the main tool used for identifying terrorists is the watch list. The INS has access to the watch list through the Integrated Border Information System administered by the Customs Service. This list is very similar to the watch list maintained by the State Department. However, the names of people entering the country are often not checked against the list because of time constraints, limited personnel, and computer problems at ports of entry. Moreover, at the Canadian border most people crossing are not checked against the list. While those entering under the visa waiver program have never had their names checked and therefore it may seem obvious that we need to do so at the port of entry, one may still reasonably ask why a person with a visa, who has been cleared by a consulate, still should have his name checked each time he enters the United States. The case of Khalid al Midhar shows why rechecking the watch list each time a person enters the country could be an important tool for keeping terrorists out of the country.7 Al Midhar is an example of someone who was identified as a terrorist after he received his visa but before he entered the country for a second time. Of course, even if his name had been put on the watch list in January of 2001, he might still have been missed by immigration inspectors because, as discussed above, not all persons entering the country are checked against the list. There is no technological impediment for creating a system to check all names at ports of entry, though doing so would require more resources, including computer equipment, training, and personnel. Terrorists Have Successfully Crossed the Border Illegally. In the section above dealing with the immigration status of terrorists it was pointed out that two terrorists, Abdel Hakim Tizegha (who took part in the Millennium plot) and Gazi Ibrahim Abu Mezer (who planned to bomb the New York subway system), tried to cross the northern border illegally. Tizegha was captured only after he successfully entered the country and took part in the Millennium plot. Mezer, on the other hand, was caught three times between 1996 and 1997 trying to sneak into the United States. On his third attempt in June 1997, the Canadian government refused to take him back, and the INS paroled him into the U.S. and started deportation proceedings. The fact that the INS released Mezer into the country was certainly a mistake, but his case points to perhaps an even larger issue. Mezer had applied for a visa to study in the United States and was turned down in 1993. He eventually received a Canadian student visa, though he later admitted that his real intent was to enter the U.S. If we improve our visa processing system so that terrorists find it increasingly difficult to get visas, but fail to strengthen our land borders, we can expect that terrorists will do exactly as Mezer did. Having failed to obtain a visa, he simply tried to take advantage of weakness at the border. The Mezer case also shows that defending the land border is not hopeless because he was, in fact, caught three times. Weaknesses at Sea Ports. Like our land borders, sea ports are also a place where terrorists have snuck into the country. Millennium conspirators Abdelghani Meskini and Abdel Hakim Tizegha both originally entered the United States as stowaways on ships that docked at a U.S. port. Tizegha later went to live in Canada for a time before sneaking back across the northern border in November of 1999. A much greater effort must be made to police ports where cargo is loaded and unloaded. Crew members of cargo ships, stowaways, and those being smuggled into the country are all potential threats. Even if we improve visa processing and security at the borders and at ports of entry, but continue to neglect seaports, it is reasonable to assume that terrorists will simply try and enter there. With respect to national security, our immigration system is only as strong as its weakest link. The sections above discussed a number of cases in which inadequate screening of visa and green card applicants, weaknesses along the border and at ports of entry, and the failure of foreign governments and federal agencies to share information may have all helped terrorists enter the United States. In this section, we examine how lax enforcement of immigration laws within the United States has facilitated terrorism. Of the 48 terrorists in this study, 12 were living illegally in the country when they committed their crimes, and several others had been illegal aliens at some point prior to taking part in terrorism. Thus, enforcing immigration laws in the interior of the United States, in particular apprehending and removing those who have overstayed visas, could have disrupted terrorist plots. Unfortunately, the INS, Congress, and successive administrations have never tried to develop a comprehensive interior enforcement strategy. As a result, over the last decade millions of illegal aliens have lived and worked in the United States with impunity, including a number of terrorists. Illegal Alien Terrorists Have Often Held Jobs. The Immigration Reform and Control Act of 1986 barred those in the country illegally from holding jobs. The ban on hiring illegal aliens has, for the most part, not been enforced. As a consequence, over the years, at least eight terrorists have taken advantage of this lax enforcement and worked in the United States illegally at some point prior to taking part in terrorism. Murderer of CIA employees Mir Aimal Kansi; Millennium plot conspirator Abdelghani Meskini; 1993 World Trade Center bombers Eyad Ismoil, Mohammed Salameh, and Mahmud and Mohammed Abouhalima; and two terrorists who took part in the plot to bomb New York landmarks, Amir and Fadil Abdelgani, all worked in the United States illegally at some point.8 Holding a job can be important to terrorists for a number of reasons. By giving them a means of support, it helps them to blend into society. Neighbors might otherwise become suspicious of young men who do not work, but seem able to pay their bills. Moreover, supporting themselves by working may help terrorists avoid receiving money from abroad. This may be useful to them because bank accounts and financial transactions between the United States and overseas are often monitored by the CIA, FBI, and foreign law enforcement agencies. Of course, terrorists who do not work can still arrive with large sums of cash, but this too creates risks of detection. In contrast, because the law with regard to illegal aliens working is almost entirely not enforced, working illegally in the United States provides terrorists with money, cover, and virtually no risk of being caught. Driver's Licenses, Bank Accounts, and Enrollment in School. Post-9/11 investigations have found that the hijackers had no difficulty in obtaining driver's licenses, opening bank accounts, or even attending flight school without student visas. All of these activities were critically important to their being able to carry out the attacks. According to the federal indictment against Zacarias Moussaoui, in the summer of 2000, hijackers Mohammed Atta and Marwan al Shehhi opened a joint checking account in Florida and received more than $100,000 from an account in the United Arab Emirates. This money was used to pay for flight instructions, travel, and other living expenses. It is doubtful that the terrorists could have carried out their attacks without this money. The indictment also indicates that 9/11 terrorists Fayez Ahmed, Saeed al Ghamdi, Hamza al Ghamdi, Waleed al Shehri, Ziad Jarrah, Satam al Suqami, Mohand al Shehri, Ahmed al Nami and Ahmed al Haznawi all opened bank accounts in Florida in the summer of 2001. Clearly, opening accounts was an important part of the plot; otherwise they would not have gone to the trouble of doing so. In general, banks allow those with visitor visas to open checking accounts if they have a driver's license. (Since Atta did not receive his license until May 2001, he apparently was able to open his account without one.) Getting an American driver's license is helpful not only in opening bank accounts but also facilitates the renting of motor vehicles and small aircraft, holding a job, buying ammunition, accessing government archives, and of course, boarding commercial airplanes. Atta and al Shehhi received their driver's licenses from Florida in May 2001 despite the fact that Atta had been stopped for driving without a license a few months earlier in the state. According to the Washington Post, at least eight other 9/11 terrorists obtained Virginia licenses illegally.9 Virginia was used by the terrorists because prior to 9/11 the requirement for obtaining a license in that state was one of the weakest in the nation. There is little question that the ability to obtain what has become our nation's de facto national ID a U.S. driver's license was very important to the 9/11 hijackers and for this reason many of them went to the trouble of obtaining them. Another area where the laxity in the law helped the 9/11 terrorists concerns their attending flight schools in the United States. In theory, attending a flight school requires an M-1 or vocational student visa. In reality, all the INS requires is that applicants who have entered on business or tourist visas apply for a change of status to an M-1 visa so they may attend flight school while their application is processed. Atta and al Shehhi had applied for such a change and in fact had finished their classes before their change of status was approved. Thus, even if their application had been denied, which is very unlikely, they would have already finished their classes anyway. 9/11 hijacker Nawaf al Hamzi, who entered on a tourist visa and Khalid al Midhar who used a business visa also were allowed to enroll in flight school even though they did not have M-1 visas. While the terrorists may have found other ways to get flight training, the current system certainly made it much easier for them to obtain the training they needed. Perhaps almost as important, a complete disregard for the functional purpose of visas can only create contempt for immigration law among school administrators, immigrants, and even the very INS officials who are charged with their enforcement. At the time this report was written, the INS was in the process of changing the rules governing a change of status so that it would no longer be possible to attend school on a visa other than a student visa. Ahmad Ajaj, who took part in planning the first attack on the World Trade Center from his prison cell, was held after he tried to enter the country on a false Swedish passport in September of 1992. Detaining him limited the role he could play, but did not prevent him from helping to plan the attack from his jail cell. Nonetheless, apparently because of limited detention space, he was released a few days after the first World Trade Center bombing, having served six months for passport fraud. The INS was not aware when it released him that he was part of the Trade Center conspiracy. However, the agency was aware that the he committed fraud, that he had no legal right to be in the United States, and that he had bomb-making manuals in his possession when first detained. Thus it is hard to comprehend why the INS still released him. What is clear is that in each of these cases the INS released a terrorist into the United States at least partly because they simply did not have the detention space they need. Recent congressional hearings indicate this situation continues. Interior Enforcement Is Completely Neglected. Enforcing immigration laws within the United States represents an enormous challenge, but the above analysis makes clear that there has not even been a good-faith effort to do so. While some additional funds have been devoted to border control in recent years, enforcement inside the United States has been almost non-existent. Allowing those in the country illegally to hold jobs, receive driver's licenses, open bank accounts, and receive green cards, and failing to detain those who violate the law, conveys to terrorists and non-terrorists alike that one can violate U.S. immigration laws with little difficulty. As a consequence we now have an estimated eight to nine million illegal aliens in the United States according to the latest estimates from the Census Bureau.11 More important for the purposes of this study is the fact that terrorists who have violated immigration law have taken part in every major attack on U.S. soil. Had we developed an interior enforcement strategy, a number of terrorist attacks might have been averted. The complete lack of interior enforcement cannot help but make it much easier for al Qaeda terrorists to operate in the United States. A reduction in the level of temporary and permanent immigration in order to give the INS and State Department the breathing space they need to deal with the huge backlogs that currently exist and to implement the fundamental reforms that are needed. Entry to the United States is not a right, but a privilege, granted exclusively at the discretion of the United States. For the most part that discretion is exercised by members of the State Department's Bureau of Consular Affairs, also referred to as the Consular Corps. The Bureau has made some genuine technical improvements in the issuing of visas in recent years. These changes have included making visas machine-readable and more difficult to forge than in the past. Also, the watch list of people who should not be granted visas is now computerized, replacing the old microfiche-based system in place until just a few years ago. However, there is still a great deal of room for improvement. The American People, Not Visa Applicants Are the Customers. One of the most fundamental problems with the Consular Service is that it has adopted a culture of service rather than skepticism, in which visa officers are expected to consider applicants their customers rather the American people. Thus, satisfying the customer the foreign visa applicant has become one of the most important goals, leading to pressure to speed processing and approve marginal applications. As one former Foreign Service officer has written, State Department procedures call for supervisory review of refusals, but not issuances thus, relatively inexperienced junior officers are trusted to issue visas but are second-guessed on refusals.12 Visa officers are judged by the number of applications processed each day and politeness to applicants rather than the thoroughness of screening applicants. This is especially ironic given that the law requires precisely the opposite approach, placing the burden of proof on the applicant for a temporary nonimmigrant visa. The case of Lafi Khalil shows that a weak interview can be as bad as no interview at all. Consular officers must ask hard questions even at the risk of annoying the applicant. Any incongruities in the applicant's story must be investigated, and the officer must be completely satisfied that the applicant has been entirely truthful. If the officer has any doubts, then by law the person should not be issued a visa. Remove Visa Processing from Jurisdiction of State Department. The development of an attitude whereby customer service is stressed rather than the protection of the American people stems partly from the fact that visa processing is part of the State Department. Responsibility for issuing visas fell to the State Department because it was the only agency with offices overseas, where the demand was. But it is difficult to imagine two less compatible functions than diplomacy and immigration enforcement. The diplomat's goal of promoting cooperation and compromise is sometimes in conflict with the gatekeeper's goal of exposing fraud and ensuring compliance with the law. 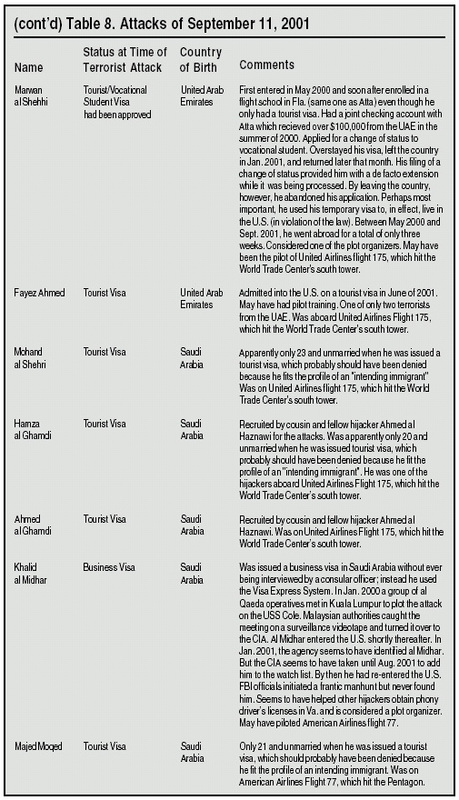 Consider the case of Saudi Arabia, home to 15 of the 19 hijackers. Michael Springmann, a consular officer in Jeddah, Saudi Arabia, from 1987 to 1989, was quoted in the November 25, 2001, St. Petersburg Times as saying he issued more than 100 visas to unqualified applicants after pressure from his State Department bosses. Keep the Saudis happy, Springmann said he was told, apparently because they are America's biggest supplier of crude oil. This systemic mismatch between visa processing and diplomacy is likely to persist regardless of management changes and may only be remedied by transferring all visa-issuing responsibilities overseas to the INS or perhaps a new Visa Corps, which is discussed below. Another possibility that would make sense is placing visa-processing under a new homeland security department. Removing the conflict of interest between visa processing and diplomacy by creating a new free-standing visa issuing agency with offices in consulates around the world is one possibility. This new agency would issue visas and be answerable not to the local ambassador, but to the head of this new agency or perhaps even the head of homeland security. If INS was to take control of visa processing overseas, then the Visa Corps could be answerable to INS headquarters in Washington. Moreover, if visa processing was the career choice of all visa officers, those who would work in this area would be able to hone their skills at spotting fraud or security risks. Visa officers need to be highly trained professionals, specializing in their function, respected by their agency, and insulated, to the extent possible, from political pressure. Such a system would be an invaluable asset in making our nation safer from terrorism. Strict Enforcement of 214(b) Could Reduce Terrorist Threat. 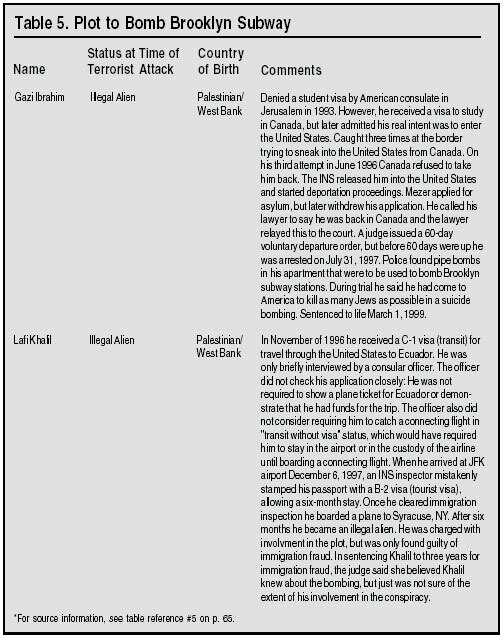 As we have seen, a number of terrorists in the past, including 9/11 ring leader Mohammed Atta and 1993 World Trade Center bomber Mohammed Salameh, fit the profile of an intending immigrant, which should have led U.S. consular officers to refuse their nonimmigrant visa applications under Section 214(b) of the Immigration and Nationality Act. According to the statute, persons are not to be issued temporary visas if they cannot demonstrate that they are unlikely to settle in the United States illegally. As already discussed, likely intending immigrants are those whose age, employment situation, marital status, and overall attachment to their home country indicates that there is a high probability they will try to stay in the United States. Intending immigrants and terrorists often have similar characteristics. A number of terrorists have been young unmarried men, with little income and education. This seems to have been the case for 9/11 hijackers Mohand al Shehri, Majed Moqed, and Ahmed al Haznawi. Unattached men make ideal candidates for terrorism, especially for a suicide mission. Older, more established individuals who hold leadership positions in al Qaeda, such as Egyptian-born Mohammed Atta, also can be excluded under 214(b) because they are likely to have lived outside of their home countries. The Egyptian government and other governments throughout the Middle East have cracked down hard on Islamic militants. As a result, it is often in the West where they can operate freely. Persons who have lived outside of their home countries show weak attachment to their homelands and thus must be presumed to be more likely to overstay their temporary visas. Therefore, stricter adherence to the expectations of the statute, a stronger prevailing attitude of skepticism among consular officers, especially toward out-of-country applicants, and greater understanding of the need to invoke Section 214(b), the keystone of non-immigrant visa law, could be a highly effective tool against terrorism, especially when coupled with technological and intelligence enhancements that will improve the terrorist watch list. With some three million illegal aliens living in the United States who have overstayed their visas, strict adherence to 214(b) could also have a significant impact on efforts to reduce illegal immigration. More Resources Are Needed for Visa Processing. Administrative changes, of course, won't matter much if there aren't enough people to handle the work. Assistant Secretary of State Mary Ryan said in November of last year, I think consular officers around the world are stretched just about as thin as they can possibly be. We do not have the personnel resources that we need to do the job the way it should be done.13 The Bureau of Consular Affairs has only about 900 Foreign Service officers overseas, assisted by 2,500 foreign nationals, and the demand for visas to visit the United States is enormous. In 2000, the State Department issued 7.1 million nonimmigrant visas, up 15 percent from 1995, and more than triple the number issued 30 years ago, when the majority of visas were issued to citizens of countries (mainly Western Europe and Japan) which now no longer need visas when arriving on short visits. Because of this ballooning workload, all junior Foreign Service officers are required to adjudicate visa applications for a year or more, turning this profound responsibility into a dreaded rite of passage for new Foreign Service officers. Consular officers often have no more than a few minutes to assess each application. What's more, visa responsibilities are held in such low regard institutionally that consular ranks are often filled by unemployed spouses of local Foreign Service officers. Watch Lists and Biometric Identification Need to Be Improved. But even with adjusted incentives and adequate personnel, successfully handling such an enormous workload and keeping out those who would do us harm requires the right tools. Obviously, effective intelligence is required for the watch list used by consular officers overseas to be valuable. But based as it currently is on names, rather than also using a biometric identifier like a fingerprint, many possible terrorists might slip through. While fingerprints or photos will never be available for most of those on the list, many persons on the watch list have been arrested or detained by authorities in other countries or on previous stays in the United States. To the extent possible, we need to obtain these fingerprints and photos when available and make them part of the watch list database. To be most effective, the visa process should start with each applicant's fingerprints and photos being digitally scanned into an integrated system, one that can be accessed by everyone involved in the immigration process overseas, at the border, and within the country. These photos (using facial recognition software) and fingerprints should be checked against the watch list. Ideally, visitors' fingerprints should be scanned again when they enter the country and again when they leave. This wouldn't be cheap to establish, but the technology is already widely used; in fact, the Border Patrol has been scanning fingerprints of illegal aliens apprehended on the Mexican border for several years now. Gathering applicant fingerprints and scanning them again when a person enters and leaves the country would serve many purposes: first, it would be a way of definitively determining that someone has entered the country and also that they have left when they are supposed to. Second, it would be a way of excluding those on the watch list for whom we have fingerprints or a photo. Third, it would establish identification, ensuring that the person issued the visa is the same person entering the country. Fourth, it would prevent individuals from going from consulate to consulate using different identities if they have been denied a visa at one location. Fifth, providing the U.S. government with photos and fingerprints could, by itself, be a significant deterrent to would-be terrorists who certainly would be reluctant to give the U.S. government this information. Photos and Facial Recognition Software Could Be Important Tools. Facial recognition software is a promising new technology that we need to explore. If we took a digital photo of every visa applicant and ran it through facial recognition software (which is already fairly well developed), along with fingerprints for each applicant, we might also be able to identify terrorists. This would be especially useful for keeping out those who apply for a visa using a false identity. Photos could also be useful for keeping out individuals whom we suspect as terrorists but do not know their names. For example, in January 2000, hijackers Khalid al Midhar and Nawaf al Hamzi were videotaped by Malaysian authorities taking part in a meeting of al Qaeda operatives in Kuala Lumpur. The video was turned over to the CIA, but it took time to identify those at the meeting, including al Midhar and al Hamzi. However, if their photographs were placed in the system without their names, facial recognition software might have determined in a timely fashion that they had been issued visas in 1999. Alternatively, if we learn the face but not the name of a terrorist prior to his getting a visa, then the photo taken during the visa application would keep him from getting a visa once it was run through facial recognition software. While a facial recognition system would take time to implement, it is a promising new area of technology that the INS and State Department should move aggressively toward implementing. Updating and Maintaining the Watch List Must Be Made a High Priority. It is clear that the watch list is an important tool for keeping terrorists out of the country. But it is also clear that updating the list and making it as expansive as possible has not been the high priority that it should have been for the intelligence community, law enforcement, or even the State Department. The fact that foreign governments knew that Moussaoui and Abouhalima were possible terrorists but their names never made it onto the watch list suggests that the United States is not constantly seeking to obtain the names of possible terrorists from foreign governments. Of course, some governments may not cooperate and others may be reluctant at times to provide information. Nonetheless, State Department personnel must be persistent, because identifying possible security risks and entering their names into the system must become a central responsibility of U.S. consulates and embassies overseas. Monitoring anti-American activities, including demonstrations, organizations, and publications, for names to add to the list must also come to be viewed as a critical function of the State Department. The State Department is not alone in this role. The CIA has working relationships with intelligence agencies around the world, which can and must be pressed for names to be placed on the list. The possible delay in placing Khalid al Midhar's name on the watch list suggests that putting names on the list is not the high priority that it should be for the CIA. The FBI, too, must work more closely with the State Department and the immigration service in updating the list. While recent legislation requires the FBI to share information, careful oversight will be necessary to ensure that the watch list comes to include the FBI's criminal database. A well maintained and continually updated watch list is one of the most important tools we have to protect the country. Each part of the U.S. government the FBI, the intelligence agencies, the State Department, and the INS must all come to see the maintenance of the list as critical to national security. Changing the Rules for Adding Names to the Watch List. The more aggressive collecting of information on potentially dangerous individuals suggested above needs to be coupled with changes in the procedures governing the addition of names to the watch list. At present, a consular officer has to write a highly detailed, legalistic cable justifying why a person should be placed on the list. Given the enormous workload of consular officers, it is often very difficult to find the time to write such cables. Moreover, the criteria used are too generous, giving too much benefit of doubt to the applicant. For example, an applicant who submits a document that the consular officer has verified is fraudulent, such as a false letter from an employer, still would not necessarily meet the criteria for being placed on the list. This may seem odd, because section 212(a)(6)(C)(1) of the Immigration and Nationality Act states that anyone who submits fraudulent documents is to be excluded from the United States. However, in setting guidelines for who can be added to the list, the State Department uses a concept called materiality, which means that only if the fraud was material or critical to the application being approved can it be deemed an offense that warrants placing someone on the list. In addition, an applicant is allowed to make a timely retraction of a fraudulent document. That is, an applicant who has made a fraudulent claim can avoid permanent ineligibility by making a prompt admission of guilt when confronted with his fraud. Instead of making the safety of America the top priority, the State Department in practice bends over backwards to give applicants the benefit of the doubt, even for those who commit obvious fraud. Such policies are clearly misplaced, given that admission to the United States is a privilege and not a right. This willingness to tolerate fraud and deception significantly weakens the watch list. It should also be apparent that a terrorist organization as sophisticated as al Qaeda is well aware of these procedures and can be expected to take full advantage of them. Thorough Interviews for All Visa Applicants. The case of Lafi Khalil, whose interview at the consulate was completely ineffective, shows that a weak interview can be as bad as no interview at all. At present, only about one in five nonimmigrant visa applicants are currently being interviewed by a consular officer as part of visa issuing process. The fact that at least three of the 9/11 hijackers Abdulaziz Alomari, Salem al Hamzi, and Khalid al Midhar never met with a consular officer and instead submitted their applications through a travel agency in Saudi Arabia made it much more likely that their applications would be approved. Ineffective or non-existent interviews significantly increase the chance of fraud and reduce the possibility that incongruities or even outright lies by the visa applicant will be detected. If the consular service is better insulated against political pressure and is transformed into the experienced and highly trained profession suggested above, then the interviews can become an important tool for protecting the nation from those who intend to do us harm. Of course, for the interview to be effective, all applicants would have to be interviewed. This would require more staff and resources, making it necessary to significantly increase the size of the consular service. All Enemies of America Should Be Excluded. Visa officers should be instructed to deny visas to people who are clearly enemies of America, but who have not actually committed a terrorist act. Currently, the law makes it extremely difficult to turn down an applicant because of his beliefs, statements, or associations, if such beliefs, statements, or associations would be lawful within the United States. As the law now reads, keeping out a terrorist sympathizer, who publicly organizes demonstrations calling for the destruction of America or actively distributes Osama bin Laden videos, but who as far as we know, hasn't yet raised money for terrorist groups or planned out an assault, requires the Secretary of State to make the decision personally and then report each individual instance to four congressional committees. As a result, few if any individuals are excluded based on their anti-American beliefs. We will not, of course, know the political beliefs of most applicants. However, just as we learn about the possible terrorist links of some individuals from friendly governments as well as our own intelligence, we will also learn of those who express strong anti-American views. These individuals can then be added to the watch list. Some may object to the idea of excluding people based only on their political beliefs, but it is important to remember that getting a visa to come to America is a privilege, not a right, and it is only common sense to exclude those who advocate violence toward our country. It is also important to remember that being denied a visa does not prevent such a person from continuing to express his views in their own country. It is simply irresponsible not to exclude all such individuals. No Third-Country Visa Processing. As we have seen, a number of terrorists linked to al Qaeda were issued visas by consulates outside of their home countries, including two of the worst terrorists in American history, Sheik Omar Abdel Rahman and Mohammed Atta. Applying in a third country could be helpful to terrorists because consular officers there often do not speak the applicant's native language or are unfamiliar with conditions in the applicant's home country. This cannot help but reduce the chance that an implausible story or other problems with the application will be detected. Moreover, it is primarily in the West where many Islamist terrorists congregate, because governments in the Middle East have often suppressed such extremist movements. American consulates in western countries are therefore very likely to process visas applications from possible Islamist terrorists. But, these consulates are also much less likely to be able to evaluate such applications. If a policy of no third-country visa processing is not possible for all applicants, then at the very least citizens of those countries that have sent terrorists to the United States in the past, such as Egypt, Algeria, Pakistan, and Saudi Arabia, should be required to return to their home countries for as thorough a security clearance (working with local authorities) as possible by the American consulate. There is nothing unprecedented about such country-specific visa policies; for instance, because they are part of the visa-waiver program, persons from Japan can come to the United States without a visa, whereas a person from, say, Poland must obtain a visa. It is true that these provisions apply only to temporary visas, but a much higher bar for both temporary and permanent visas for nationals from some countries, and no third-country processing, is simply a logical extension of this kind of policy. Adjustment of Status Should End. Persons in the country legally on temporary visas are allowed to remain in the United States while they undergo processing to receive their green cards or change to another temporary status. Persons undergoing change of status are usually not interviewed by the INS. Changes of this kind done from within the United States are called adjustment of status. For example, Mohammed Atta and Marwan al Shehhi entered on tourist visas but were allowed to attend flight school while the INS processed a change to an M-1 or vocational student status. Another example might be that a person, such as Wadih el Hage, who enters on a student visa and later marries an American can have their application for permanent residency processed while they remain in the United States. In addition, a controversial provision first created in 1994, referred to as Section 245(i), allows illegal aliens (visa overstayers or those who have snuck across the border) to undergo processing for permanent residence within the United States, provided the applicant pays a $1,000 fine. This provision has lapsed and been renewed several times over the last eight years. From a national security standpoint there are two significant problems with allowing aliens (legal or illegal) to undergo changes of status without going home to be processed. First, having the INS process applicants in the United States instead of requiring the alien to return to his home country increases the chance that any problem with the application will be missed. Consular officers in the home country are more likely to speak the local language and know the local conditions, and are in a much better position to judge the validity of the application than is an INS employee who might be half a world away. The second, and perhaps most important reason adjustment of status is problematic is that even if the INS could assess applications as well as the State Department, processing applications from within the United States renders the background check meaningless because if a person is found ineligible, he is still in the country. The INS has no procedure or means to require applicants who are rejected to leave the country. Mohammed Salameh, who was turned down for a green card, remained in the country and participated in the 1993 attack on the World Trade Center. In contrast, if the applicant had to return to their home country to undergo processing and was then found ineligible he would have, in effect, deported himself. Requiring applicants to return home is the only way to make the background check meaningful. This is true for all forms of adjustments of status, including those covered by Section 245(i). Section 245(i) is especially problematic because many people who benefit from it have never been cleared by a consulate because they snuck into the United States. In sum, changing status is a chance to keep out those who are a danger to the country by interviewing them and by checking the watch list, which is continually being updated. By allowing adjustments from within the United States we are, in effect, missing out on an important opportunity to keep terrorists out of the country. And we know that a number of terrorists have adjusted status from within the United States, including Marwan al Shehhi, Mohammed Atta, Sheik Omar Abdel Rahman, Mohammed Saleh, Mahmud Abouhalima, Wadih el Hage, Amir Abdelgani and Fadil Abdelgani. The previous section of the study focused on a number of changes needed in the way green cards and visas are issued. However, the nation's ports of entry (where foreigners enter the country by land, sea, and air) and our borders between crossing points are also important. Careful examination of foreign citizens at ports of entry is an indispensable part of protecting the nation, as are the nation's land and sea borders. Unfortunately, the level of resources devoted to these areas has been grossly inadequate. Creation of Computerized Entry-Exit System. There is also the long-standing and very real problem that the INS does not know whether foreign visitors admitted on temporary visas actually leave the country when their visas expire. There is no mechanism for tracking land departures, and the system for tracking arrivals and departures by air, which is how most visa-holders travel, is largely non-functioning. The current system requires foreign visitors to fill out a two-part form with their name, passport number, and destination. The visitor then hands one part to the U.S. immigration inspector upon arrival. The other half is collected by the flight attendants on the outbound flight and later transferred to the INS. The opportunities for failure are enormous: airlines often don't collect the forms or forward them to INS; visitors may enter by air but leave by land, leaving no trace of their departure; the information on the paper forms may be illegible or is improperly keyed into the system by the INS contractor. The system is so dysfunctional that INS's statistics division feels that it is not possible to estimate the number of people who have overstayed visas after 1992. Time limits on a visitor's stay in the United States are only meaningful if we know whether the deadline has been honored. Because we do not collect accurate exit information, we have no way of knowing if someone has left the country. At least 13 of the 47 terrorists in this study had overstayed a temporary visa at some point prior to taking part in terrorist activity.14 In 1994, the bipartisan U.S. Commission on Immigration Reform, headed by the late Barbara Jordan, called for computerized tracking of all arrivals and departures by land, sea, and air (including Canadians, who don't need visas). Congress, in the 1996 immigration law, directed the INS to develop such a system, but partly at the behest of the business community in border states, this provision was postponed and in 2000 effectively shelved by Congress. The concern was that the system would create interminable traffic jams along the Mexican and Canadian borders as people lined up to enter and leave the United States, but a technologically modern system with an adequate number of scanners should not significantly impede traffic. The border security bill recently signed by the president would mandate the creation of such a system. The key is to ensure that Congress and the administration provide the money, oversight, and political support for such a system to ensure that the INS creates a working system in a timely fashion. All Persons Entering the Country Need to Be Checked Against Watch List. Currently, INS and Customs inspectors at ports of entry have access to the watch list through the Integrated Border Information System administered by the Customs Service. However, many people who enter the country are not checked against the list because of limited personnel and time constraints at airports. As for the land borders, the vast majority of foreign nationals who enter along the Canadian border are not checked against the list because of the high volume of traffic and limited personnel. Moreover, while no hard figures exist, the computer systems of the INS often are not functioning properly at ports of entry. For the watch list to become a truly effective tool, all persons who enter the United States must have their names checked against the watch list even if it takes longer to clear people through immigration inspections at land borders and airports. Checking the names of all person entering the country against the watch list is especially important for those from visa-waiver countries. The case of Zacarias Moussaoui, who is a French citizen, shows that the reach of al Qaeda extends to visa-waiver countries in Western Europe. In the case of Moussaoui, while his name was not on the list, it could have been because French authorities were aware of his ties to Islamic extremists. As was already discussed in the case of Khalid al Midhar, who was identified as a terrorist between trips to the United States, shows why re-checking the watch list each time a person enters the country is necessary even for those who have a visa and have been cleared by a consulate overseas. All Persons Entering at Border Crossings Needed to Be Examined. At present, the nation's land points of entry are often not fully staffed, and only a fraction of cars and trucks are inspected. Part of the solution here is straightforward many more inspectors and more inspection lanes at crossing points. Immigrant-smuggling through ports of entry, using fake papers or hiding in secret compartments, was almost completely shut down when security along the borders was tightened in the wake of the September 11 attacks. The problem, of course, was that inadequate staffing and infrastructure caused long waits, but thorough checking plus additional inspectors can equal better security without excessive delay. Ahmed Ressam's arrest in 1999 with a car full of explosives shows that careful inspections at the border can be extremely valuable. Border Patrol and Infrastructure at the Border Must Be Expanded. Staff and infrastructure between crossing points is grossly inadequate. Better screening of visa applicants and a tightly monitored entry-exit system would be almost meaningless if it continues to be easy to cross the border illegally. Gazi Ibrahim Abu Mezer who was denied a visa, eventually went to Canada and tried to sneak into the United States. At a Senate hearing before the Committee on Governmental Affairs in November of 2001, INS officials indicated that persons apprehended at the Canadian border are still sometimes paroled into the United States because Canada often will not take them back and the INS does not have enough detention space.15 As far as we know, terrorists have so far only penetrated the northern border; if the Canadian border were to be made more secure, there is every reason to believe that the Mexican border would become attractive to terrorists. Significant smuggling of Middle Easterners across the southern border has already taken place. For example, Iraqi-born smuggler George Tajirian has pled guilty to forging an alliance with a Mexican immigration officer, Angel Molina Paramo, to smuggle "Palestinian, Jordanian, Syrian, Iraqi, Yemeni, and other illegal aliens through Mexico and into the United States." There is no way to know if any of the 1,000 Middle Eastern illegals Tajirian helped get into the country are terrorists.16 But his case does show that persons from the leading terrorist source countries can and have used the southern border to enter illegally. If they have not done so already, there is every reason to think that crossing illegally from Mexico would become an attractive option to al Qaeda terrorists if other means become more difficult. While persons from the Middle East may stand out more in Mexico than in Canada, which has large Middle Eastern communities, widespread official corruption in Mexico may make that country a useful transit point for Islamist terrorists in the future. While a serious attempt has been made in recent years to increase the size of the Border Patrol, there are still only about 9,000 agents, and on any given shift, there are only about 1,700 agents on duty at the southern border. Moreover, there are only a few hundred agents patrolling the entire 4,000 mile border with Canada and this is where terrorists have most often tried to cross. A February 2000 report by the Justice Department's Inspector General (IG) sheds light on how inadequately the northern border is patrolled. It found that at one 300-mile sector of the border, agents identified 65 smuggling corridors but had only 36 sensors to monitor them.17 Such sensors are designed to detect motion or heat or metallic objects and in sufficient numbers could be valuable force-multipliers. Moreover, the IG report found that in some short-handed sectors, there are times when there are no agents on duty at all. The answer, of course, is increased personnel and a serious commitment to border security. The Border Patrol has actually increased significantly since the mid-90s, and has been doing a much better job of patrolling the southern border, reducing illegal crossings near major cities. These successes need to be expanded upon while improving coverage of the northern border as well. The Border Patrol could be increased from its current total of less than 10,000 to perhaps 30,000 or 40,000, without even nearing the point of diminishing returns. While this cannot be accomplished overnight, policing the border is a fundamental right and responsibility of any sovereign nation. If it makes sense to spend over $300 billion a year on our military and maintain over a million persons on active duty in the armed forces to defend the country, then surely it makes sense to have a Border Patrol that is large enough to do its job. Failure to do so is a huge invitation to terrorists rendering all other efforts at immigration enforcement greatly weakened, if not irrelevant. The final layer of effective immigration control lies inside the country. As already discussed, very little effort is made to enforce immigration laws within the United States. There is strong evidence that at least 22 of the 48 terrorist in this study had violated immigration laws in some way prior to their taking part in terrorism.18 In many cases these terrorists lived, worked, opened bank accounts, and received driver's licenses with little or no difficulty. Because such a large percentage of foreign-born terrorists violated immigration law, enforcing the law would be extremely helpful in disrupting and preventing terrorist attacks. In order to develop an effective interior enforcement strategy a number of significant changes in policy are clearly needed. A Tracking System for Temporary Visa Holders is Both Desirable and Possible. The federal government often has no idea whether foreign visitors have left when their visas expire. In addition, it often has no idea where foreign citizens live while their visas are still valid. A number of terrorists have been tourists and business travelers, and it would be very difficult track such individuals within the United States. Even in the current environment, it is unrealistic to expect all foreign visitors to submit their passports every time they check into a hotel and to expect hotels to report that information. Currently, foreign travelers are required to write down their destination upon entering the United States, but no effort is made to verify the information; in fact, two of the 9/11 jihadists listed Marriott Hotel, New York as their destination. Perhaps there is some practical means for tracking tourists and business travelers; developing such a system would certainly be a significant challenge, but it is certainly something the INS should at least be studying. While tracking tourists and business travelers may not be possible at present, it would be possible to track foreign citizens residing here for extended periods of time who are affiliated with an American institution responsible for their whereabouts. Such a system makes sense because many of these long-term visitors (here from one to six years, or more) reside here for a long time in a legal status, whereas short-term visitors are less likely to have the time to hatch sophisticated plots before their visas expire. Although short-term tourists and business travelers, who are not attached to any American institution, make up the majority of nonimmigrants, the number of long-term visa holders requiring oversight is still quite large. In 1999, there were more than 923,000 foreign students and exchange visitors admitted (including their spouses and young children), up 45 percent just from 1995. And the number of long-term foreign workers, plus family members, was approximately 1 million in 1999, up 123 percent from 1995.19 Tracking these individuals through their American institution is both desirable and possible. If they leave their schools, jobs, or otherwise violate the visa we would know it immediately, and then we could send out an investigator while the trail was still warm. Tracking Foreign Students is Also Necessary. One of the largest single categories of long-term temporary visitors is foreign students (F-1 and M-1 visas). A number of terrorists originally entered on student visas, including Eyad Ismoil, a conspirator in the 1993 World Trade Center bombing, and 9/11 hijacker Hani Hanjour, and both were in the country illegally when they committed their crimes. Ismoil dropped out after three semesters and remained in the United States illegally, while Hanjour never even attended class. Both Khalid Abu al Dahab and Wadih el Hage originally came to the United States on student visas, later married Americans, and became naturalized citizens. The 1996 immigration law mandated that the INS develop a computerized tracking system for foreign students to replace the current manual, paper-based system. Unfortunately, the system has not moved beyond the pilot stage, and has only been tested in a couple of dozen southeastern schools, largely because of opposition from universities and colleges. Institutions have opposed it, fearing the extra administrative burden and also because they do not like the idea of treating foreign students differently from their American counterparts. But given the very real threats we face, tracking students makes perfect sense. Ideally such a system would provide the INS with real-time information verifying a student's enrollment and immediately notify the INS if the student drops out or otherwise is not honoring the terms of his visa. The border-security bill recently signed by the president will go a long way toward creating such a system. Of course, it remains to be seen whether such a system will be given the resources and political support it needs to be fully implemented. It should also be pointed out that the problem with the whole foreign student program is not simply one of visa fraud or overstays; the nature of their studies is also a matter of concern. In 1997, the Washington Institute for Near East Policy published a report highlighting the weaknesses in our efforts to prevent students from terrorism-sponsoring states from studying subjects that would benefit those countries' weapons programs.20 Not only are very few students denied visas based on their desired fields of study, but the lack of monitoring allows them to declare their intention to study some innocuous social science, for instance, but then change majors to nuclear engineering or the like, without anyone in the government being alerted to this fact. Tracking majors therefore should be a high prior of any student tracking system. Tracking System Must Be Expanded to Non-Students. There is no reason to limit the tracking system only to foreign students. There are an additional million temporary workers, trainees, and intra-company transferees who can and should be included in such a system. Expanding the new tracking system to cover both foreign students and foreign workers is needed to ensure that the system is as comprehensive as possible. INS enforcement then could follow up with the sponsoring employer or other institution as soon as they receive notice that the person is no longer honoring the terms of the visa. Names of Visa Overstayers Should Be Placed in a Criminal Database. In January of 2002, the INS announced that it was going to add to the FBI's criminal database the names of more than 300,000 illegal aliens who have been ordered deported, but whose departure the INS cannot verify. This is certainly a good start, but once a well-functioning entry-exit system is in place, there is no reason why the names, photos, and fingerprints of all visa overstayers could not also be added to the criminal database. In that way, if they are ever arrested for a crime or even a traffic stop they could be held by local police and then turned over to the INS. This could become a key component of interior enforcement. Although no hard figures exist, with 3 to 4 million visa overstayers living in the United States, there is no question that tens of thousands of them are arrested or pulled over in traffic stops each year. Traffic stops and arrests are a significant opportunity to apprehend those in the country illegally and we should take full advantage of it. While adding visa overstays to the criminal database would help reduce illegal immigration, one may still wonder if it would ever be useful against terrorists. In fact, two of the 9/11 hijackers were pulled over in traffic stops in months preceding the attacks. In the spring of 2001, the plot's ringleader, Mohammed Atta, received a traffic ticket in Broward County, Florida, for driving without a license. He had, by this time, overstayed his visa on his previous visit to the United States between June of 2000 and January of 2001, though the INS at Miami International Airport allowed him back into the country. Had a system of carefully tracking overstays and placement of names into the criminal database been in place, then we potentially could have averted the 9/11 attacks. Although he had not overstayed his visa, Ziad Samir Jarrah, who was on board United Airlines Flight 93 that crashed in Pennsylvania on 9/11, was issued a speeding ticket on September 9 in Maryland for driving 95 miles an hour in a 60-mile-per-hour zone. Thus, even the most sophisticated terrorists in American history seem to have run afoul of the law prior to carrying out their plans. Of course, for the INS to quickly take custody of visa overstayers detained by police, it would need more detention space and more agents assigned to interior enforcement. By adding the names of visa overstays to the criminal database, the INS would in effect enlist the help of thousands of local law enforcement officers. Enforce the Ban on Hiring Illegal Aliens. The centerpiece of any interior enforcement strategy has to be enforcing the prohibition on hiring illegal aliens. While worksite enforcement, as it is commonly called, may not seem to be vital to national security at first glance, it is, in fact, vital to reducing the terrorist threat. In 1986, Congress prohibited the employment of illegal aliens, although enforcement was at first spotty and has been virtually non-existent for the past decade. Although it is obviously directed at turning off the magnet of jobs attracting conventional illegal aliens, such worksite enforcement is also important for anti-terrorism efforts. Gaining control of the border between crossing points is probably only possible if we dramatically reduce the number of illegal job seekers who routinely cross into the United States. If prospective illegal aliens knew there was no job waiting for them in the United States, fewer would try to cross illegally, making border management security possible. Moreover, the estimated 8 to 9 million illegals now living in the country have created a vast market and infrastructure for fraudulent documents. The existence of widespread fraud can only make it easier for terrorists to operate in the United States. In addition, it would be much harder for terrorists who overstay their visas to blend into normal life if finding a job is made more difficult. A number of terrorists have worked illegally prior to being arrested for terrorism. At least eight of the terrorists in the study (Kansi, Meskini, the Abouhalima brothers, Salameh, Ismoil, and Amir and Fadil Abdelgani) worked in the United States illegally before being arrested for terrorism. There are also indications that Mir Aimal Kansi worked illegally in Northern Virginia in the 12 months between the time he overstayed his business visa and when he applied for asylum and received a work permit. Of course, terrorists could still come with large sums of cash and try to live undetected, but doing so would be much harder if getting a job is much more difficult. Worksite Enforcement Must Be Made Effective. There are two steps that are needed to make worksite enforcement effective. First, a national computerized system that allows employers to verify instantly that a person is legally entitled to work in the United States needs to be implemented. Employers would submit the name, date of birth, Social Security number (SSN), or alien registration number to the INS for each new hire. This information is already collected on paper, but is not used by the INS. After an instant check of its database, the employers would then receive back from the INS an authorization number indicating that the person is allowed to work in the United States. The authorization number would provide the employer an iron-clad defense against the charge that they knowingly hired an illegal alien. Tests of such systems have generally been well-received by employers. Document fraud, of course, is widespread, but a computerized system would be a key tool in uncovering it. For example, a valid SSN that is linked to a different name and submitted to the INS, or a SSN and name that show up among numerous employers across the country, would both be indications that a worker is trying to skirt the law. The INS could develop procedures to identify potential problems of this kind. When a potential problem is found, the INS would then go out to the employer and examine all the paperwork for the employee, perhaps conducting an interview with the worker and determine the source of the problem. Dramatically Increase the Number of INS Investigators. Investigators from the INS are charged with such tasks as worksite enforcement, anti-alien smuggling efforts, and combating document fraud. There are only approximately 2,000 agents assigned to interior enforcement for the entire country. This number must be increased dramatically. At present there are only the full-time equivalent of 300 INS inspectors devoted to worksite enforcement year round, whose job it is to enforce the ban on hiring the five or six million illegal immigrants now working in the country. If the number of investigators was increased to the levels necessary, they could begin to visit employers identified by the verification system as having a potential problem, and additionally could randomly visit worksites to see that employers were filing the paperwork for each worker as required by law. Those employers found to be knowingly hiring illegals would be made to pay stiff fines. It is not just in the area of worksite enforcement that more investigators could be put to work. The entire system of tracking students and perhaps others envisioned in current legislation and discussed above requires that there be enough agents to locate those identified by the tracking system as having violated their visas. If we create a tracking system, for example, but there are no agents to investigate those who stop working or attending class, then a tracking system is almost meaningless. Failure to develop such a system means that millions of illegal immigrants will continue to work and live in the United State facing little or no penalty. Not only does this make a mockery of the rule of law, it also exposes the country to significant security risks. Enforce Employment Verification and Alien Registration. Most of the recommendations outlined above have dealt with temporary visa holders or efforts to reduce illegal immigration. More effective monitoring is also needed of permanent residents. A number of militant Islamic terrorists have been legal immigrants, including Sheik Rahman, el Gabrowny and Mahmud Abouhalima. Until the 1980s all non-citizens living in the United States were required to register annually their whereabouts with the INS. This practice should probably not be revived in that form. Potential terrorists cannot be expected to dutifully send in their addresses. However, the employment verification system outlined above could be a very effective tool in locating non-citizen legal immigrants. This is especially important when a person is placed on the watch list after he has entered the country. At present, there is often no way for the INS to know where that individual lives; however, the employment verification process would provide the INS with the last known employer for green card holders who work. Thus, if it became necessary to arrest or at least undertake surveillance of a non-citizen, his last known employer would be a place to start. The verification system would in effect be alien registration, at least for those resident aliens who work. The INS Must Integrate Databases. One reform that would be relatively easy to undertake would be for the INS to integrate all of its various databases. At present, separate databases are maintained for non-immigrants, immigrants, citizenship applications, and deportations. The INS needs to establish a single integrated file on each foreign citizen that uses a biometric identifier like a digital fingerprint. This file would contain information from each step in the visa process, including each land border crossing, each entry and exit at airports, each change in status at school or work, each arrest, as well as any application for permanent residence. This file should be accessible to law enforcement and would remain open until the person becomes a citizen. Prevent Illegal Aliens from Obtaining Driver's Licenses and Bank Accounts. A number of policy changes are needed to reduce illegal immigration, many of which are discussed above. One change that seems obvious is to make it more difficult for illegal aliens to get driver's licenses and open bank accounts. Bank accounts are important because they make it easier for people who work illegally in the United States to cash paychecks and transfer money abroad. Thus, by allowing illegals to open back accounts we make it easier to be an illegal alien, which in turn can only increase illegal immigration. A foreign passport should not be enough to open an account in the United States. A person should be allowed to open an account only with a U.S.-issued driver's license or state I.D. card. The key is to prevent illegals or temporary visitors (tourist and business visas) from getting driver's licenses. A number of the 9/11 terrorists were able to get licenses and open bank accounts with little difficulty. Virginia, which issued eight drivers licenses to terrorists, only requires that a third party attest to the fact that the license applicant is a state resident. This is a clear invitation for illegal aliens and terrorists to obtain drivers licenses. All states must require birth certificates and other supporting documents for licenses. Unfortunately, a number of states do not carefully verify identity or eligibility for a license and in fact some jurisdiction now explicitly allow illegal aliens to get licenses. Not only do licenses make it easier to open bank accounts, licenses are also helpful when accessing government documents, looking for a job, renting motor vehicles, and of course boarding commercial airliners. If we are serious about reducing illegal immigration and protecting the country from terrorists, then doing a great deal more to prevent illegals from opening bank accounts and obtaining drivers licenses will have to be part of our efforts. Tolerating Illegal Immigration Facilitates Terrorism. Many of the above reforms are designed to reduce illegal immigration and with it the terrorist threat. But one might reasonably point out that most illegal aliens are not terrorists. However, allowing a large illegal population to reside in the United States facilitates terrorism for two reasons. First, it has created a large underground industry that furnishes illegals with fraudulent identities and documents that terrorists can (and have) tapped into. Several of the 9/11 terrorists were assisted in getting their Virginia driver's licenses from someone who specialized in helping run-of-the-mill illegal aliens obtain them. Second, the existence of a huge illegal population creates a general contempt or disregard for immigration law. Although the general public may still want the law enforced, the scale of illegal immigration creates a tacit acceptance by law enforcement, policymakers, and even the INS itself. For example, it was far easier for an immigration inspector to allow Mohammed Atta back into the country even though he overstayed his visa in January 2001 knowing that there have been millions of overstayed visas in the past decade and policymakers had done nothing about it. The release of Ahmad Ajaj and Gazi Ibrahim Abu Mezer from detention even though they had no legal right to be in the country does not seem so outrageous when one considers that immigration law is routinely violated and millions of people are allowed to live in the country illegally. Tolerating mass illegal immigration is by no mean the only factor increasing the chance that terrorists will successfully enter and remain in the country, but by not enforcing immigration law we certainly made life easier for the large number of terrorists who had broken immigration laws in the past. Amnesties for Illegal Aliens Have Helped and Not Hindered Terrorists. The existence of a large illegal population clearly creates a host of problems for the United States. Instead of enforcing the law, some have suggested giving green card to the illegals, thereby eliminating the illegal population. Of course, this would not solve the problem of future illegal immigration; after the last amnesty in 1986, the 2.7 million who were given green cards were replaced by new illegal aliens by the mid-1990s. While the events of 9/11 have significantly reduced political support for what had been growing momentum to grant amnesty to Mexican and perhaps other illegals, the idea will likely re-emerge at some point in the future. Some have even argued after 9/11 that granting amnesty would be helpful to national security because it would allow law enforcement to know who is in the country. For this reason some amnesty advocates have even taken to calling it a "registration" of illegal aliens. However, in the past, amnesties have helped terrorists, and do not impede them in any way. Mahmud Abouhalima received amnesty under the 1986 Immigration and Reform and Control Act, by falsely claiming to be an agricultural worker even though he was a cab driver. Given the limited resources of the INS, it was not possible to investigate or even verify the stories of the millions of people who applied for amnesty. As a result, the vast majority who applied for the amnesty were approved. Issuing Mahmud Abouhalima a green card facilitated his terrorism because he could then work at any job he wished and was able to travel to and from the United States freely. In fact, according the October 4, 1993, issue of Time magazine, it was only after he received his green card in 1990 that he made several trips to Pakistan, where he received combat training. Thus, the 1986 amnesty is what made his training by al Qaeda possible. Had Abouhalima not been given permanent residency, he would not have been able to travel abroad and become a trained terrorist. The case of Mohammed Salameh, who rented the truck used in the 1993 World Trade Center bombing, shows why an amnesty will not hinder terrorists. His application for amnesty was denied because he was not as adept at making fraudulent claims as was Abouhalima. The INS did its job in his case and rejected his application on its face. However, because there is no mechanism in place to force people who are denied a green card to leave the country, he continued to live and work in the United States illegally and ultimately take part in terrorism. Thus, in the past terrorists who applied for amnesty either received it, making their operations easier, or, when turned down, simply continued to engage in terrorism unhindered. In sum, the last amnesty only helped terrorists and did nothing to hinder those involved in the first Trade Center bombing. If we are to have an amnesty, then at the very least we first need to devote a great deal more resources to interior enforcement, including detention space and INS agents assigned to investigate applications and to detain and remove those found ineligible. Enforcing the Law is Critical to Reducing Terrorism. This report has made clear that immigration laws are often not enforced, and that this has facilitated terrorism over the last decade. At least 20, and possibly more, terrorists have violated immigration laws at some point prior to taking part in terrorism. Moreover, a number of terrorists who should have been denied visas because they were at high risk for overstaying them, were still issued visas by American consulates overseas. Thus, strict enforcement of immigration laws at consulates overseas, at ports of entry, at the border, and in the interior of the United States is one of the most effective means we have of reducing the threat from foreign-born terrorists. As important as the policy changes recommend above are, the overall level of immigration creates unavoidable security threats to the nation. There are two reasons why a reduction in the legal admission of foreign citizens both permanent immigrants as well as temporary visitors is imperative for homeland security. First, it is the only way to make the administrative reforms outlined above possible. Second, a large foreign-born population has unavoidable security implications. If only a few of the terrorists who broke immigration laws were apprehended for their violations, or if consulates had done a better job of not issuing visas to those likely to overstay them, then attacks such as the 1993 World Trade Center bombing or those of 9/11 might have been avoided. The crush of work has created an organizational culture wherein staff are rewarded for the timely handling of petitions rather than for careful scrutiny of their merits, in the words of a January 2002 GAO report. The pressure to move things through the system has led to rampant and pervasive fraud, with one official estimating that 20 to 30 percent of all applications involve fraud. The GAO concludes that the goal of providing immigration benefits in a timely manner to those who are legally entitled to them may conflict with the goal of preserving the integrity of the legal immigration system.22 Assistant Secretary of State Mary Ryan was quoted earlier that consular officers overseas are stretched just about as thin as they can possibly be and that they do not have the personnel resources that we needed to do the job the way it should be done. This illustrates the dangers inherent in current levels of immigration. Reducing Immigration Will Give System Breathing Space. There might well be a large organization that could handle such a crush of work while being reorganized and assuming vast new responsibilities, especially if its provided with increased resources. But the INS is not that organization. It has a long history of very real structural and management problems that will take a long time to fix, even if the organization is split into its functional parts or combined with other agencies like the Customs Service. Its computer systems are abysmally out of date and fragmented; this stems from a decision in the 1970s not to automate the files in order to preserve low-level clerical jobs. Referring to the computer problems, the then INS Commissioner Doris Meissner told Government Executive Magazine in 1999, You don't overcome a history like that in four to five years. It takes time to hire and train personnel and create the infrastructure necessary to fix the problems in the system. The only way to give the INS and the State Department the breathing room they need to put their houses in order and to address homeland security concerns is to reduce the workload. Some demands on the system cannot be reduced: Although greater restrictions on visas could reduce the numbers somewhat, million of tourists will keep coming and legal immigrants will keep applying for citizenship. But the admission of new immigrants and foreign students and guestworkers is an area where the INS's load can be reduced dramatically. Cutting legal immigration back to the spouses and minor children of American citizens, eliminating the visa lottery, and limiting employment based immigration to only a few highly skilled individuals would be a good start. A Reduction in Permanent Immigration Should Be Explored. Although this report has made clear that a number of al Qaeda terrorists have been green card holders and naturalized citizens, most foreign citizens who enter the country each year do so on temporary visas or as part of the visa waiver program. Therefore, one may reasonably ask if the workload is too great, then why not reduce temporary immigration. While temporary immigration should certainly be reduced, permanent immigration is much more labor-intensive and takes up a very large share of the INS's attention. Permanent immigration is a central focus of the immigration service, crowding out other functions such as applications dealing with temporary immigration. In an interview with National Public Radio's All Things Considered on March 26, 2001, INS employee and union representative Jeff Young pointed out that Mohammed Atta's flight school in Florida received his final approval from the INS months after Atta was dead because permanent immigration is the top priority. Young said that standard practice is to quickly review the application, and if it was not about family-based immigration or a naturalization, and instead dealt with temporary immigration, then it would be placed on a stack and given a very, very low priority. This seems entirely appropriate, since unifying families, for example, should be a much higher priority than processing a change of status. Nonetheless, because permanent immigration is a central focus of the INS, it takes up a very large share of its time. It should also be pointed out that permanent immigration, unlike temporary immigration, results in citizenship applicants down the road, which also have to be processed by the INS. Moreover, a disproportionate share of deportations each year, which are extremely labor-intensive, are green card holders, because unlike most temporary visitors, permanent immigrants are in the country long enough to commit a deportable offense. Thus, although most foreign citizens enter on temporary visas, permanent immigrants, for obvious reasons, require a very large share of the INS's time and resources. As for reducing temporary immigration, reducing the current caps (or placing caps for the first time) on various student and guestworker visas would also help provide the essential breathing room needed if the INS is ever going to fulfill its role in homeland defense. Promoting the Americanization of immigrants by reducing the ongoing flow of newcomers would help reduce the prevalence of community characteristics that allow terrorists to operate with relative impunity transiency, inability to speak English, attachment to old loyalties and prejudices, and mistrust of the new country's institutions, such as the police. It's not that Muslim immigrant communities or immigrant communities in general are willingly shielding terrorists, but rather that the insularity intrinsic to immigrant communities creates an ideal environment for terrorists to operate. In his address to the joint session of Congress after 9/11, President Bush said that al-Qaeda is to terror what the Mafia is to crime. This comparison is instructive. While immigration was ongoing, and for at least a generation after it was stopped in the 1920s, law enforcement found it very difficult to penetrate the Mafia. But with the end of immigration, the assimilation of Italian immigrants and their children accelerated. The more widespread use of English, the gradual erosion of Old World attitudes like omerta (the code of silence), the dispersion out of ethnic enclaves, and the development of a sense of real membership and ownership in America all made it much more difficult for the Mafia to function. This allowed law enforcement to do its job more effectively, and resulted in the eventual crippling of the Mob. In the same way, accelerating assimilation in Muslim immigrant communities by reducing immigration will make it harder for terrorists to operate there harder to find cover, harder to recruit sympathizers, and harder to raise funds. All this would enhance the security of America. Of course, assimilation takes time, but this is a long war and we must think about long-term strategies as well as short-term responses that will make the country safer. Al Qaeda Is Trying to Recruit Naturalized Citizens. Osama bin Laden himself apparently recognizes the importance of large-scale immigration in his war against America. A report in the November 21, 2001, San Francisco Chronicle quoted an Arabic-language newspaper account of a confession by Khalid Abu al Dahab, who was one of the naturalized U.S. citizens involved in the Embassy bombings in Africa. Dahab worked with another naturalized U.S. citizen, Ali Mohammed, during the 12 years he lived in the United States and worked for al Qaeda. According to the Chronicle, Dahab said bin Laden was eager to recruit American citizens of Middle Eastern descent. When Dahab and Mohammed traveled to Afghanistan in the mid-1990s to report on their efforts to recruit American citizens, bin Laden praised their efforts and emphasized the necessity of recruiting as many Muslims with American citizenship as possible into the organization. There is no question that like the Mafia of old, immigrant-based gangs have sprung up in immigrant communities today. By themselves they may not be a reason to reduce immigration, but al Qaeda is not simply another ethnic-based criminal organization. Terrorism is not an ordinary crime. Its goal is not localized and tolerable, as is a modest level of crime in any free society. Rather, terrorism has broad implications for the entire society. Its goal is to undermine America's national security and rain as much destruction on the civilian population as possible. It is a threat to our very survival and thus a matter of overriding importance. In the years prior to the attacks of 9/11, the immigration debate primarily focused on the economic, fiscal, demographic, and cultural impact of the unprecedented level of immigration the United States has experienced in recent decades. While these issues will continue to be important, terrorism has now been added to the debate. There remains much disagreement on the costs and benefits of immigration and on what reforms are desirable; however, almost all observers now agree that more has to be done to keep foreign-born terrorists out of the country or to apprehend them once they have gotten into the country. In an effort to develop such policies, this report has examined the immigration status of foreign-born Islamist terrorists at the time they committed their crimes over the last decade. Rather than just focus on 9/11, we examined terrorism associated with bin Laden's organization over the last decade to provide a more complete picture of the threat we face. The findings show that terrorists have used almost every type of immigration in the last decade. They have been Lawful Permanent Residents, naturalized U.S.-citizens, temporary visitors, illegal aliens, and asylum applicants. Thus, it is not possible to focus reform efforts on just one type of immigration, such as student visas or temporary immigration in general. America's entire immigration system has been used by terrorist and thus our response must be equally broad. The analysis has also shown that there are a number of specific weakness in our immigration system that have been exploited by terrorists. Problems exist in the way visas are processed overseas, in the handling of foreign citizens at ports of entry, and in the policing of the nation's borders. The 9/11 attacks point to a number of problems. While information is incomplete, it seem very likely that three of the hijackers probably should not have been issued tourist visas, given their age, income, and marital status. Clearly how we process visas overseas is important to protecting the country. Moreover, the complete absence of interior enforcement helped the hijackers as well. At least three of the suspected organizers of the 9/11 plot Hani Hanjour, Nawaf al Hamzi, and Satam al Suqami had violated the terms of their visas by living in the United States illegally for some time prior to the attacks. The fact that the plot's ringleader, Mohammed Atta, had overstayed his visa and was still allowed back into the country by an immigration inspector at Miami airport, shows that very real weaknesses also exist at ports of entry. In some ways, the 9/11 attacks represent a microcosm of weaknesses and problems in our immigration system. If we don't more carefully process visas overseas, develop an interior enforcement strategy for illegal immigration, and fix the problems at our borders and ports of entry, then it significantly increases the chances that foreign-born Islamist terrorists will attack the United States again. Prior to 9/11, the nation may have been willing to tolerate a lax immigration system. Today, policymakers and the public are increasingly aware that such a system creates enormous risks. While it will take time and money to address these problems, reforming immigration is as important to protecting the nation from foreign terrorists as are military operations, intelligence gathering, or diplomatic initiatives. The fact that so many terrorists have violated immigration laws means enforcing the laws is one of the best tools we have for preventing terrorism. In addition to the eclectic nature of the threat and the fundamental problems in the immigration system, there is also strong evidence that national security is being jeopardized by the current high level of immigration. The fact that the State Department visa-processing system and the INS are completely overwhelmed by the number of people allowed into the country legally on a temporary and permanent basis is not really in dispute. Assistant Secretary of State Mary Ryan has said that consular officers are stretched so thin that they cannot do their jobs, and the General Accounting Office concluded in January of this year that the INS is so overwhelmed that providing immigration benefits (green cards, change of status, etc.) to all who are entitled to them conflicts with the goal of preserving the integrity of the process. It is simply not possible to have this level of immigration and protect the country at the same time. Almost all observers agree that the attacks of 9/11 are not the end; militant Islamic terrorists will continue to target America. The overthrow of the Taliban in Afghanistan, the death or capture of Osama bin Laden and his lieutenants, while certainly welcome, will not end the threat. The culture, freedoms, wealth, influence, foreign policy, and predominant religion of the United States make it a target for Islamic extremists. Because none of these things is likely to change in a way that would satisfy bin Laden and those who share his ideology, the only option for the United States is to restructure and reform its entire immigration system. Greater scrutiny of visa applicants, closer tracking of the foreign citizens we allow the country, and enforcing immigration laws, coupled with a reduction in immigration that would make this possible, are exactly the kind of reasonable reform that would enhance security without infringing on the rights of Americans. We face a clear choice as a nation: We can continue to admit huge numbers of temporary visitors and permanent immigrants and as a result have an easily penetrated immigration system or we can reduce immigration to a more manageable level that will make fundamental reforms possible. Some may worry that reducing immigration will harm the nation's economy, but the evidence indicates otherwise. In 1997 the National Academy of Science assembled most of the top immigration economists and issued a voluminous report entitled The New Americans: Economic, Demographic, and Fiscal Effects of Immigration. The report shows that the economic benefits from immigration are almost certainly very small and are, in fact, entirely outweighed by the costs immigrant families impose on public coffers. The nation's leading immigration economist, George Borjas of Harvard University, comes to much the same conclusion in his recent book Heaven's Door: Immigration Policy and the American Economy. We can reduce immigration secure in the knowledge that it will not harm our economy. Whatever one might have thought about immigration prior to 9/11, the status quo is clearly no longer acceptable. If we fail to make the necessary changes, then we will be exposing our country to risks that could have been greatly reduced. 1 Several naturalized U.S. citizens who have likely participated in terrorism are not included in this study because they were never charged in an American court and thus it is unclear whether they ever committed any crimes within the United States. For example, U.S. citizen Khalil Saeed Deek, who was extradited to Jordan from Pakistan in December 1999 for alleged affiliation with bin Laden's al Qaeda organization and suspicion of helping to plan terror attacks on U.S. targets during millennium celebrations in Jordan, is not included. Deek was released by Jordan in May 2001 for lack of evidence. He came to Los Angles in 1980 and married an American, becoming a naturalized U.S. citizen in 1985. In 1993, he trained for a year in a military camp in Afghanistan; returning to the United States he divorced his wife in 1998 and moved to Pakistan near the Afghan border. Another possible naturalized citizen terrorist is Bassam A. Kanj, a native of Lebanon, who was killed in that country in 2000 in an attack by Muslim militants against the Lebanese army. The Associated Press has reported that authorities think the militants are supported by al Qaeda. Kanj, who came to Boston in 1985 and worked as a cab driver, married an American citizen in 1988 and later became a U.S. citizen. Kanj had a close association with fellow Boston cabbie Raed Hijazi, who was born in the United States and raised overseas. Hijazi was convicted by a Jordanian military court and sentenced to death in February 2002 for being part of the same millennium plot in Jordan as Deek. Also not included is Ihab Mohamed Ali, a naturalized U.S. citizen who emigrated in the late 1970s to America from Egypt with his family. He graduated from a high school in Orlando, Fla. in 1981. Prosecutors say he assisted bin Laden's move from Afghanistan to Sudan in the early 1990s. Ali received a commercial pilot's certificate from Airman Flight School in Norman, Okla., (the same school attended by 9/11 conspirator Zacarias Moussaoui). Investigations indicate that Ihab Mohamed Ali is considered an unindicted co-conspirator in the African embassy bombings, and on May 18, 1999, federal agents picked him up in Orlando. Before a federal grand jury he said that he knew bin Laden but denied ever meeting him. He was held in jail for 16 months on a civil contempt charge for refusing to answer questions before the grand jury. He was charged with contempt and perjury in September of 2000. He may now be cooperating with federal authorities. Since March 2001, all documents in his case have been sealed. 2 Tourist visas, for example the most common type of nonimmigrant visa allow for a maximum stay of six months. However, an inspector can authorize a stay for time periods shorter than the maximum if he deems it appropriate. 3 There is a fourth component to permanent immigration the visa lottery. Individuals mail in a post card, their names are then selected randomly, and the winners and their immediate families are given green cards. 50,000 visas are awarded in this way each year. 4 Technically, Moussaoui did not overstay a visa because he entered the country using the visa waiver program. However, he did overstay the allowed time. 5 He arrived with another hijacker, Nawaf al Hamzi. Both al Hamzi and al Midhar enrolled at a San Diego flight school in January of 2000. Al Hamzi never left the country and resided in the country illegally until 9/11. 6 When he arrived in the United States in December 1996, the immigration inspector mistakenly thought he had a tourist visa and stamped his passport allowing him to stay for six months instead of the 29 days allowed for by a transit visa. 7 He arrived with another hijacker, Nawaf al Hamzi. Both al Hamzi and al-Midhar enrolled at a San Diego flight school in January of 2000. Al Hamzi never left the United States after entering in January 2000. He resided in the country illegally until 9/11. 8 Kansi did eventually receive a work permit when he applied for asylum. But he seems to have worked illegally in the United States from the time he entered in February 1991 until February 1992, when he applied for asylum. 9 Proposal Sets National Rules for State IDs, The Washington Post, April 17, 2002. 10 Written testimony on the Northern border can be found at: http://www.senate.gov/~gov_affairs/111301witness.htm. 11 The Census Bureau report with the latest estimated size of the illegal population can be found at: http://www.census.gov/dmd/www/ReportRec2.htm (Appendix A of Report 1 contains the estimates). 12 Former State Department employee Nikolai Wenzel describes conditions at overseas consulates in a report published by the Center, available at: http://www.cis.org/sites/cis.org/files/articles/2000/back800.html. 13 Loopholes leave U.S. borders vulnerable, St. Petersburg Times, November 25, 2001. 14 Those involved in terrorism who had overstayed their visas at some point include Kansi, the Abouhalima brothers, Ismoil, Salameh, Amir and Fadil Abdelghani, Khalil, and five 9/11 hijackers: Moussaoui, al Suqami, al Hamzi, and Hanjour; 9/11 hijackers Atta and al Shehhi overstayed their visas, but by filing a change of status to vocational student, they received de facto extensions. 15 Written testimony can be found at http://www.senate.gov/~gov_affairs/111301witness.htm. 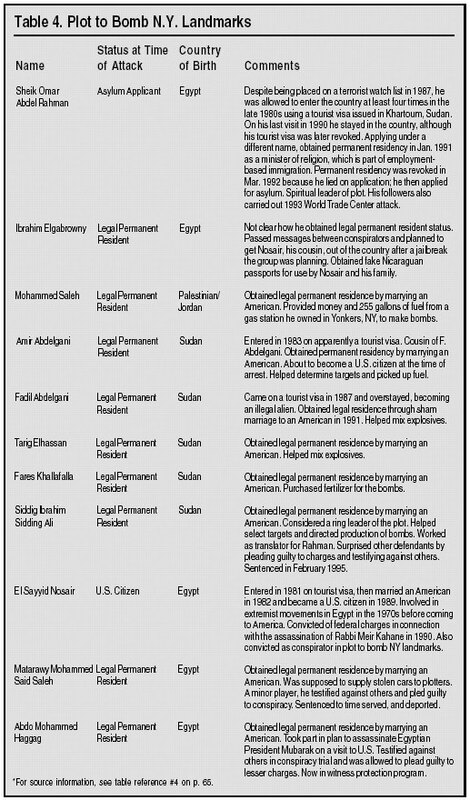 16 Iraqi Accused of Smuggling Hundreds in Mideast to U.S., New York Times, October 26, 2001. 17 The entire report is available at http://www.usdoj.gov/oig/i200004/i200004.htm. 18 Six of the seven foreign-born terrorists involved in the first Trade Center bombing had violated immigration law at some point prior to taking part in the attack. The Abouhalima brothers, Ismoil, and Salameh had all overstayed visas at some point, and Ajaj and Yousef both had no legal right to be in the country. 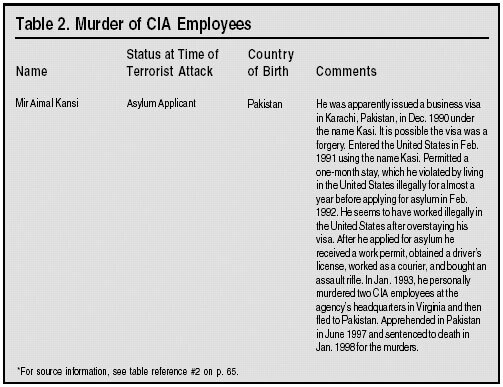 Murderer of CIA employees Kansi had overstayed his visa before applying for asylum and subway bomber Mezer had snuck into the country while his possible partner Khalil was a visa overstayer. Millennium conspirators, Ressam, Meskini, and Tizegha all had violated immigration law, Ressam with a fake passport, and Tizegha and Meskini by sneaking into the country. Sheik Rahman used fraud to gain a green card and Amir and Fadil Abdelgani had both overstayed visas. (Fadil had also engaged in a fraudulent marriage.) Embassy bomber Abu al Dahab had attempted to gain a green card through a fraudulent marriage. Four 9/11 hijackers Moussaoui, al Suqami, al Hamzi, and Hanjour had overstayed or otherwise violated the terms of their visas. In addition, 9/11 ringleader Mohammed Atta and fellow hijacker Marwan al Shehhi both overstayed their visas, although their filing of a change of status to vocational student provided them with a de facto extension while it was being processed. However, by leaving the country, they both had abandoned their change of status application. Perhaps most important, both used temporary visas to live in the country, a clear violation of the law. Between the spring of 2001, when they both entered the country, and September 11th, both lived almost continuously in the United States spending no more than three weeks abroad. 19 Because the INS does not carefully track entries and exits, these figures include an unknown number of reentries by the same individual. 20 Open Admissions: U.S. Policy Toward Students from Terrorism-Supporting Countries in the Middle East, by Hillary Mann. Executive summary is online http://www.washingtoninstitute.org/pubs/mannexec.htm. 21 Immigration Benefits: Several Factors Impede Timeliness of Application Processing General Accounting Office January, May 2001, GAO-01-488. The entire report is available at http://www.gao.gov/new.items/d01488.pdf. 22 Immigration Benefit Fraud: Focused Approach Is Needed to Address Problems, General Accounting Office January 2002. GAO-02-66. The entire report is available at http://www.gao.gov/new.items/d02600r.pdf. 23 A Nation Challenged: An Assessment; In Germany, Terrorists Made Use of a Passion: An Open Democracy, The New York Times, October 5, 2001. 24 A Nation Challenged: The Attackers; A Hub for Hijackers Found in New Jersey, The New York Times, September 27, 2001. Steven A. Camarota is Director of Research at the Center for Immigration Studies in Washington, D.C.